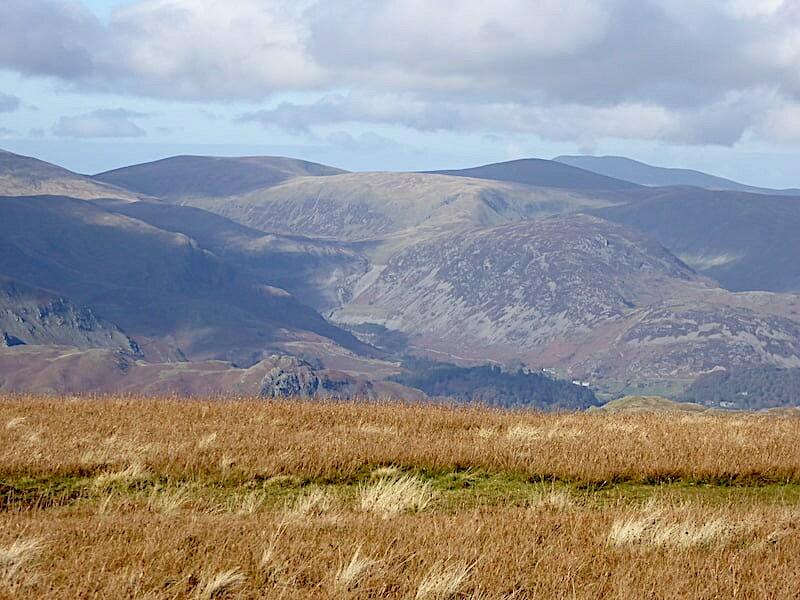 We stayed close to home today and had a very enjoyable walk up two of the Far Eastern Fells. 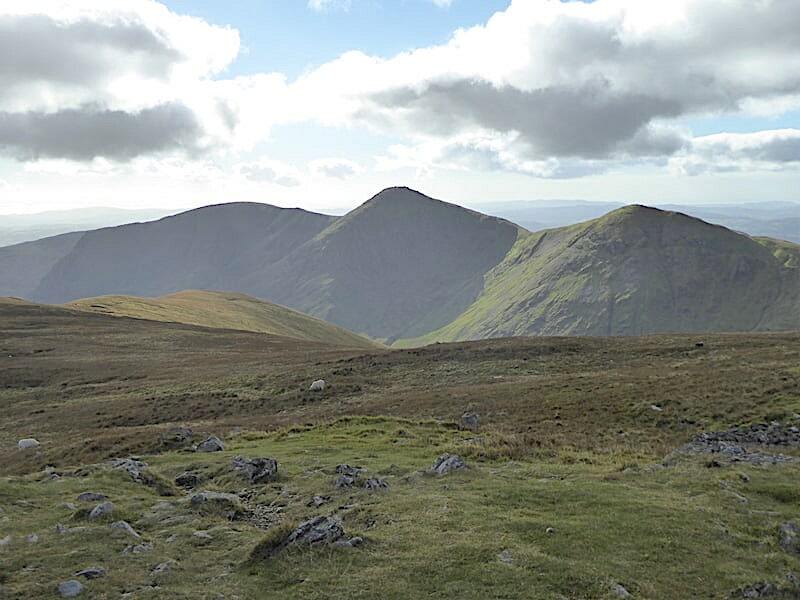 This group of fells is the one closest to where we live and visiting them involves driving only relatively short distances to their respective start points. Its very handy to have them almost on the doorstep, especially once the daylight hours begin to dwindle and you’d rather not use them up driving long distances before you can set foot on the fells. Daylight hours will dwindle even more rapidly from next weekend onwards when British Summer Time comes to an end but, for now, we make the most of what’s available. 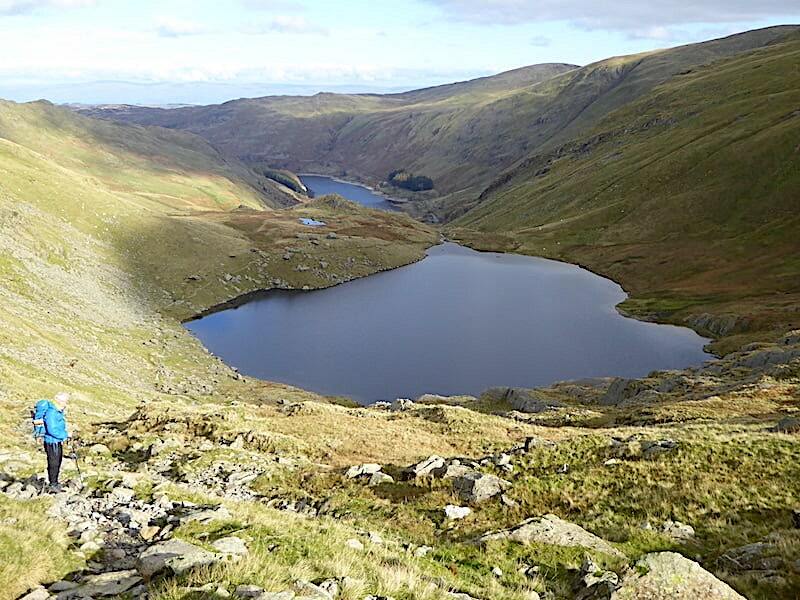 Should anyone be thinking of going up to Mardale Head please note that the road into Burnbanks is ‘officially’ closed, except for access, until 26th October, assuming the work is completed by then of course. Drainage work, which began on 17th September for six weeks, is taking place just at the entrance to the village with heavy machinery blocking the road at times. We were able to get through thanks to the kind co-operation of one of the drivers. 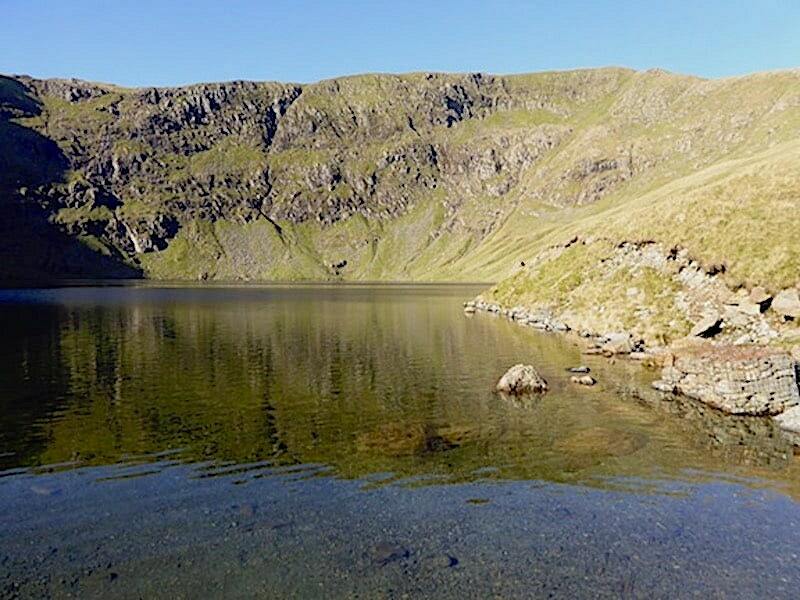 The Haweswater lake road is unaffected but the road closure meant that when we arrived at Mardale Head only two other cars were parked there which is highly unusual and gave a slightly surreal feel to the place. 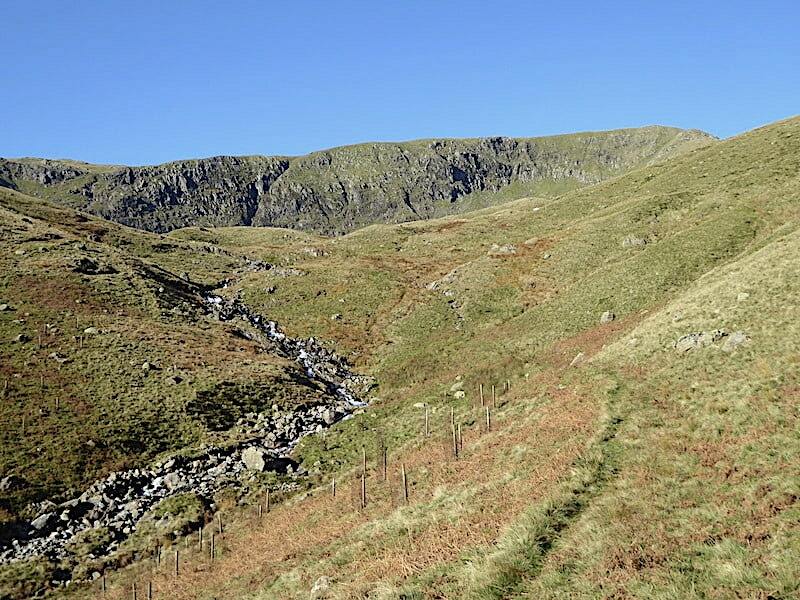 Mardale can still be accessed from Shap via Rosgill but that involves crossing the United Utilities private road running between Swindale and Mardale. There is nothing to prevent anyone using it and for many local people it has almost become a de facto right of way. Nevertheless, it is not an adopted public road so drivers must decide for themselves whether they wish to use it or not. 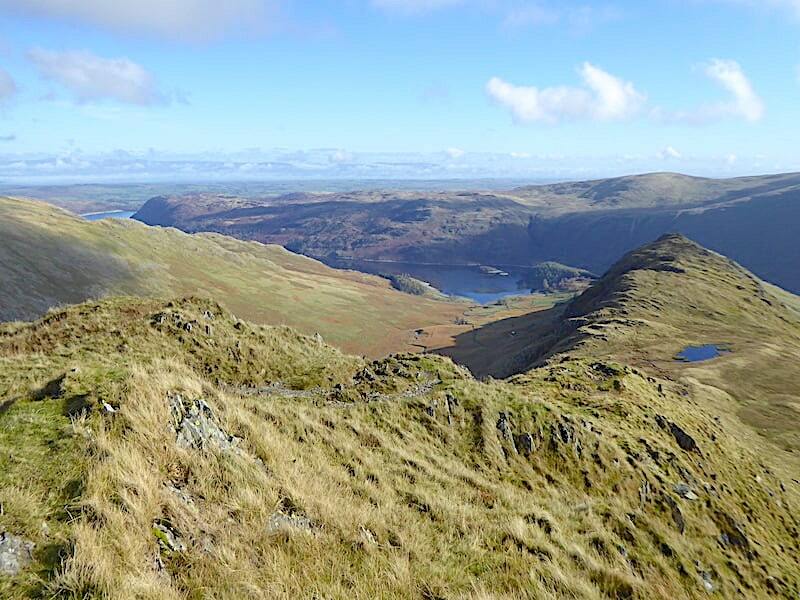 A view of Mardale Ill Bell with High Street rising to the right of it as we leave the car park and take the path across the head of Haweswater. Harter Fell and Branstree behind us are doing an excellent job of keeping the valley in some very chilly shade so jackets and jumpers stay on until we hit the warmth of the slopes opposite. A very cold night has left an icy layer across most of the bridge but a handy ice free area remains to one side of it. 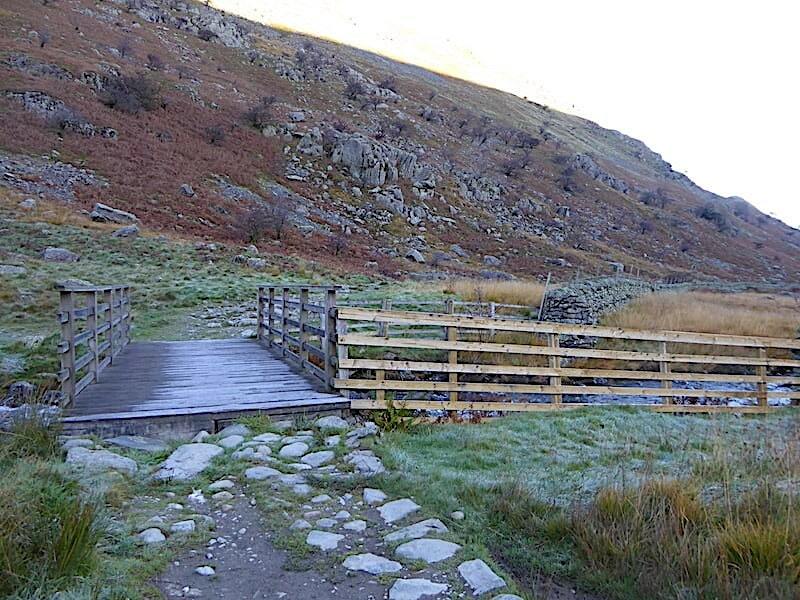 Once across the bridge we turn left and follow the path which will lead us up to Blea Water. 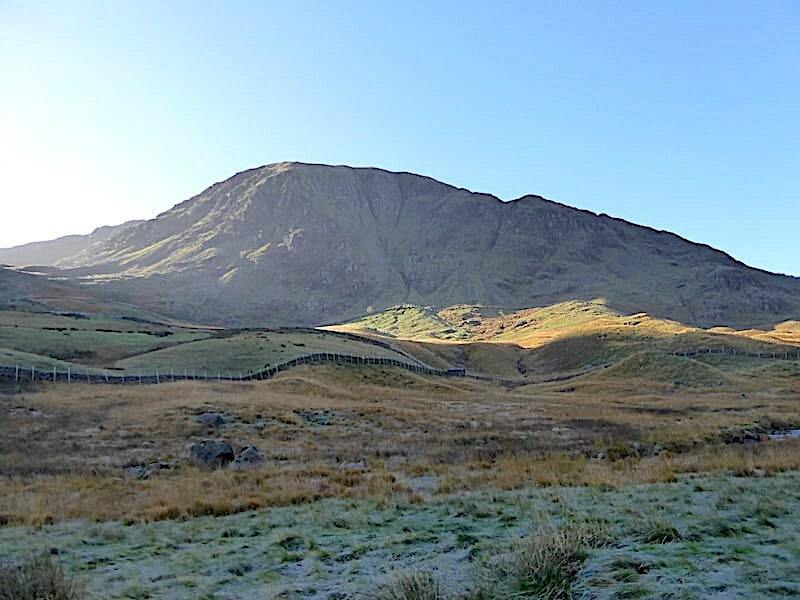 To our left, across the frosty fields, is Harter Fell. 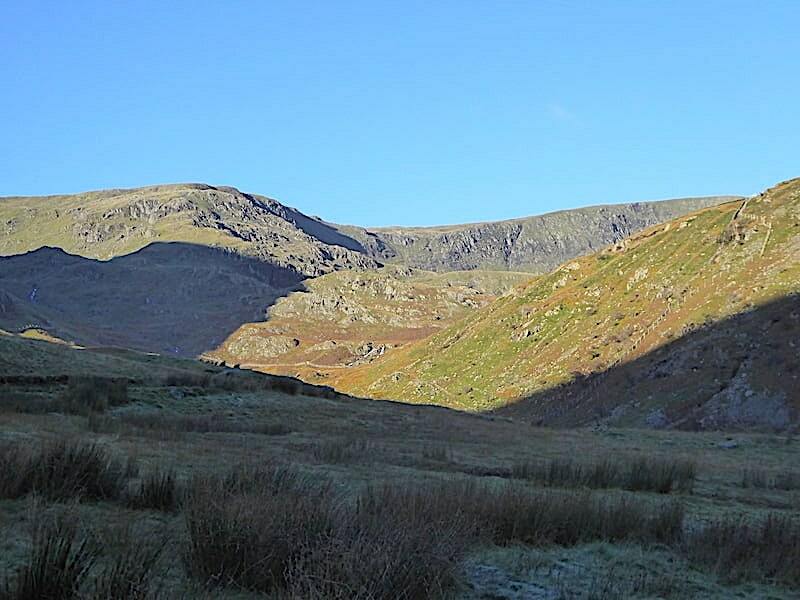 The sun’s rays land on the Gatescarth Pass between it and Branstree allowing a finger of light to brighten the chilly scene. The chill was surprisingly intense, biting at our jackets and jumpers, and we were keen to get out of it and into some warmth. 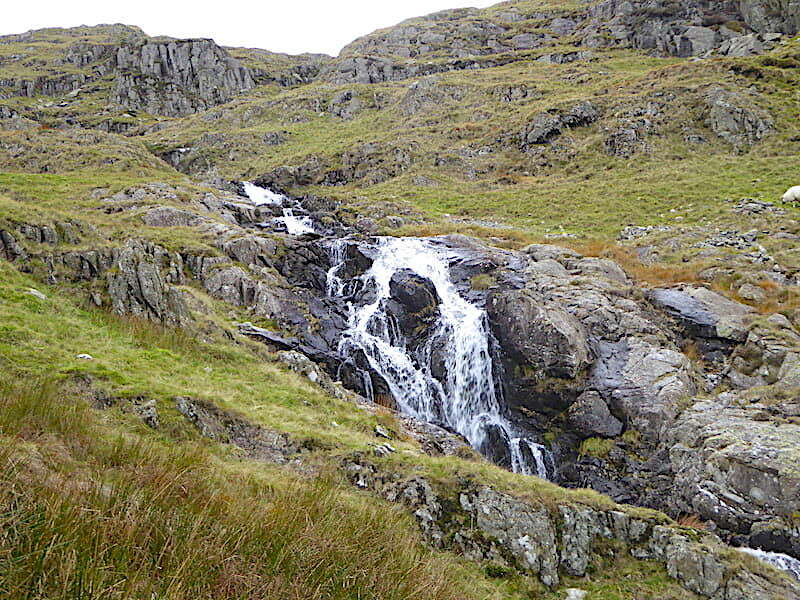 Speed was difficult though as the path was rough and stony, even icy in places, and was very, very wet. Not surprising though considering all the rain we’ve had lately. 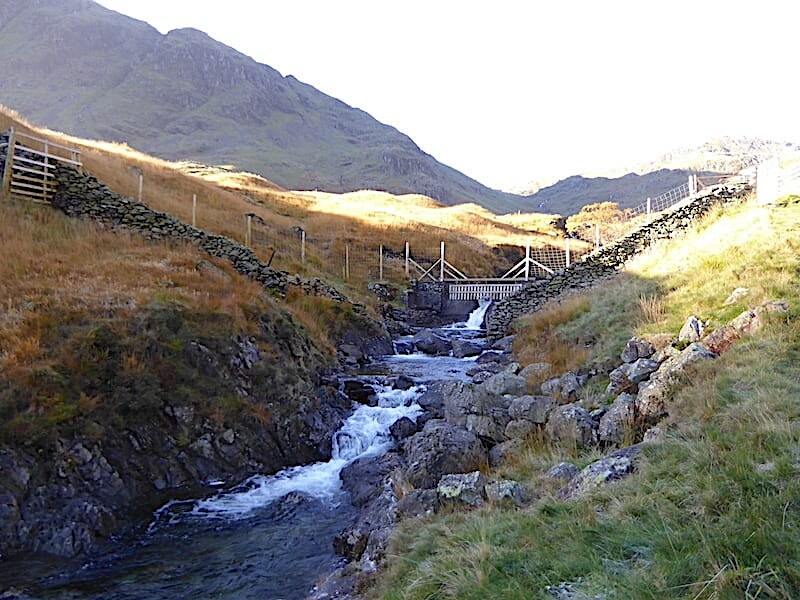 Approaching the weir in Mardale Beck and the deer gate in the wall, beyond which lie the sunny slopes and the chance to de-frost ourselves, especially our noses. We hasten our steps and pass through into the welcome warmth. Once we were into the sunlight and climbing it didn’t take long before we were needing to de-layer and stow the jumpers and jackets into our packs. My brow mopping cloth had been taken out of winter storage and, after I’d had a quick mop round with it, was tucked into the belt of my pack . I really don’t know what made me bring it but I was glad I did. 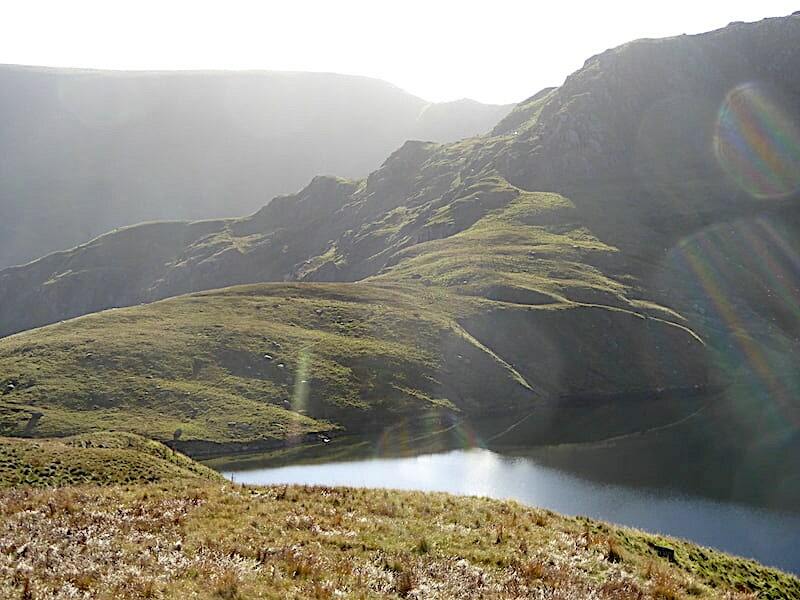 The sun on our backs as we climbed ever higher meant that it was in frequent use all the way up to High Street. 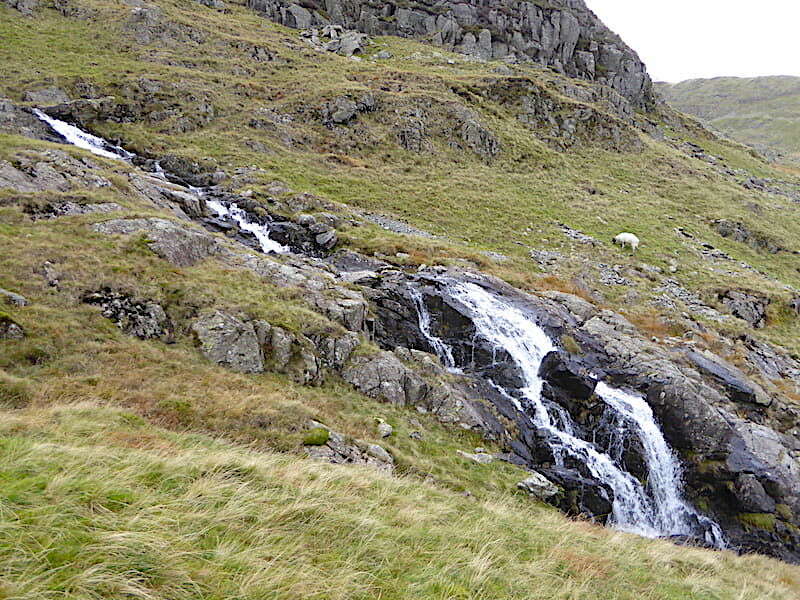 Before continuing I took this shot of Mardale Ill Bell below which is one of the falls in Bleawater Beck. 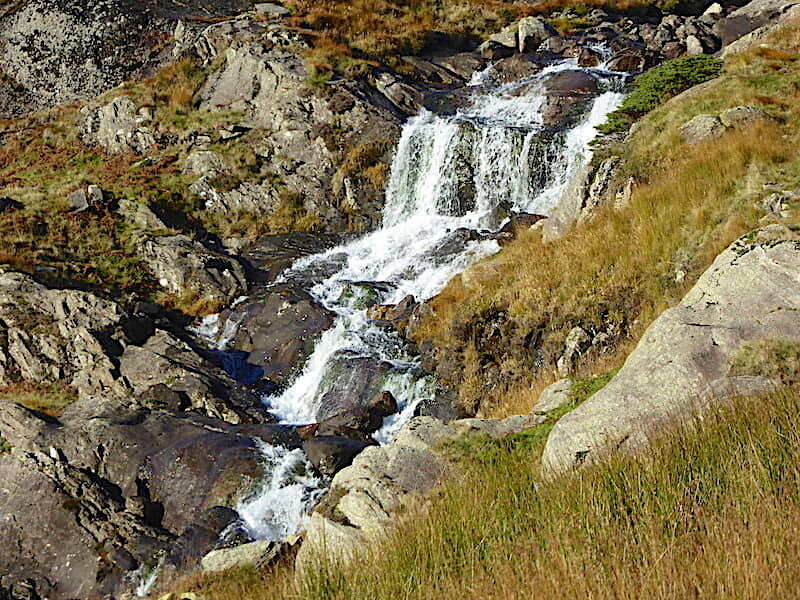 A closer look at the falls, loud enough to hear even at this distance, as the beck makes its way down to Haweswater. 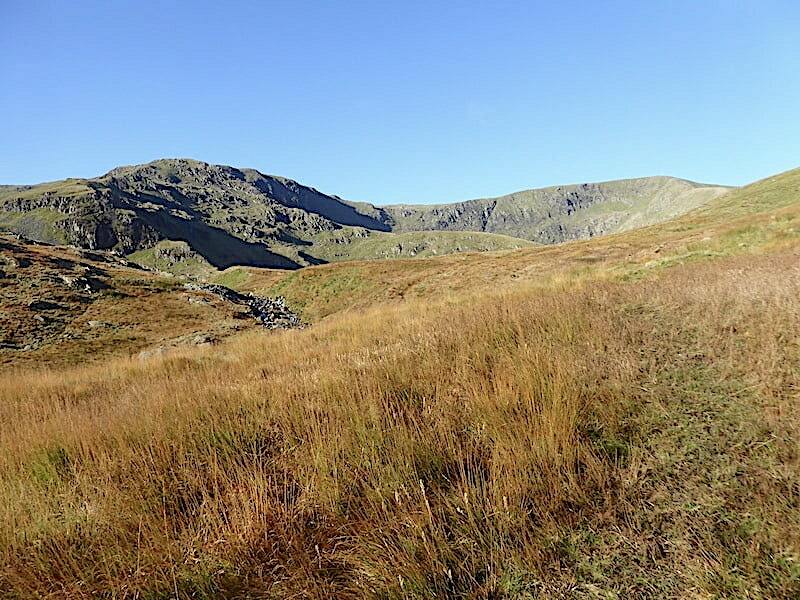 We follow the path over some very soggy ground and climb steadily, and sweatily, towards Blea Water. 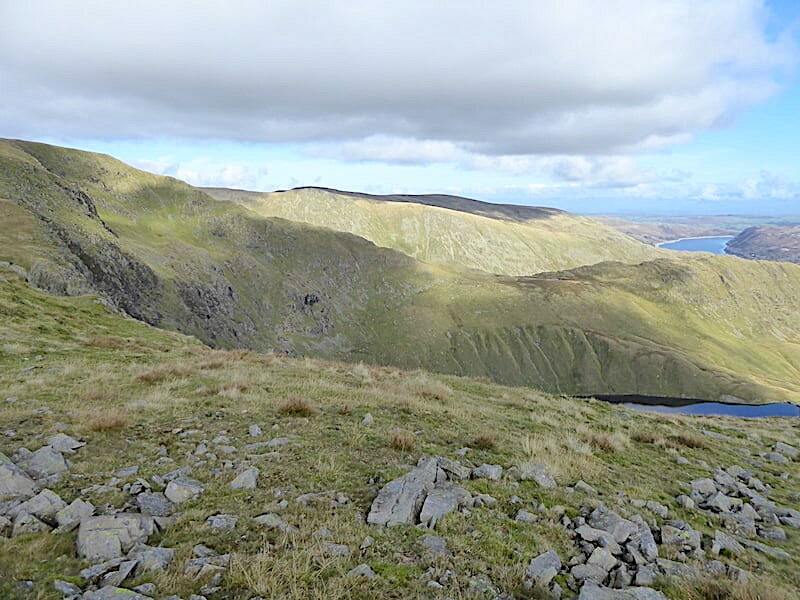 Mardale Ill Bell and High Street on the skyline. The strong light is giving the golden brown grasses a lovely glow. 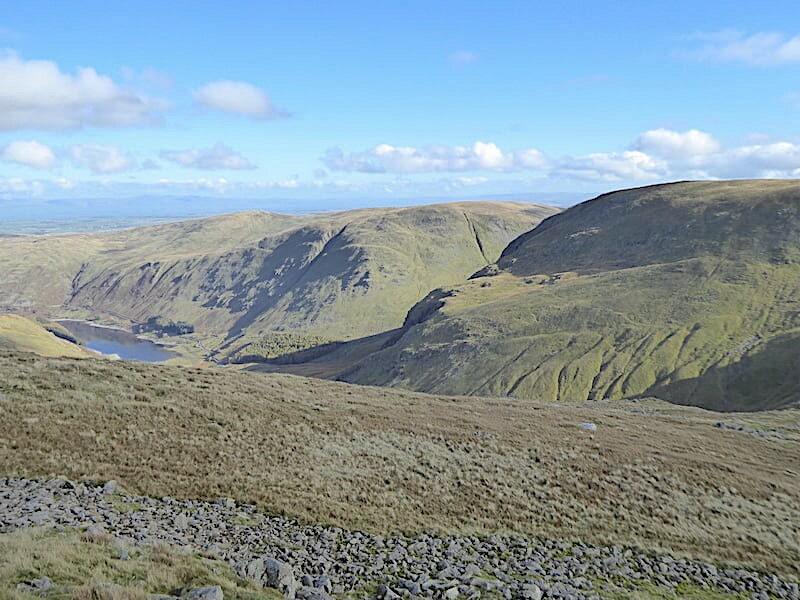 The two rocky ridges of Mardale Ill Bell’s north eastern face drop down into this flatter depression, just below the area marked on the map as Mardale Waters. It doesn’t look very watery in the shot but we did see numerous little rivulets of water dribbling down through it so its probably a bit on the damp side. We saw no reason to investigate its wetness or otherwise and kept to the path instead. That too was soggy in places. Optimistic tree planting on the sunny slopes alongside the beck but there didn’t seem to be any sign of life inside the wire cages. 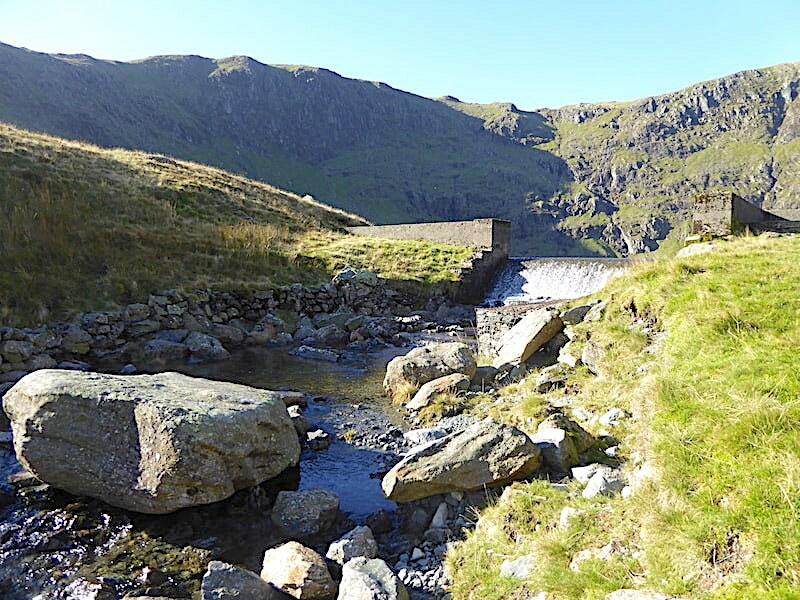 We aren’t too far away from Blea Water’s outflow at this point and …..
….. before very much longer the walls of the dam and outflow come into view. 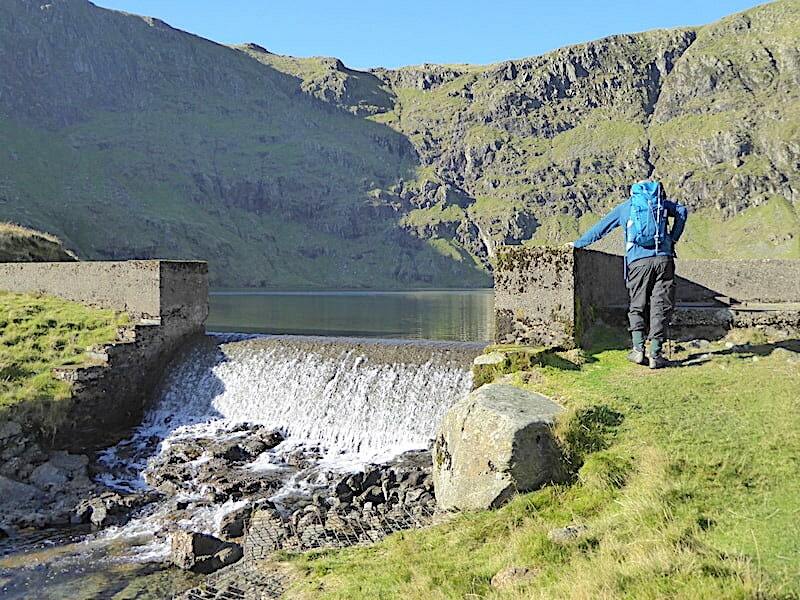 J leans on the dam wall and contemplates the soaring crags of Mardale Ill Bell, High Street and Long Stile which surround this corrie tarn, reputedly the deepest tarn in the Lake District at just a little over 200′ deep. 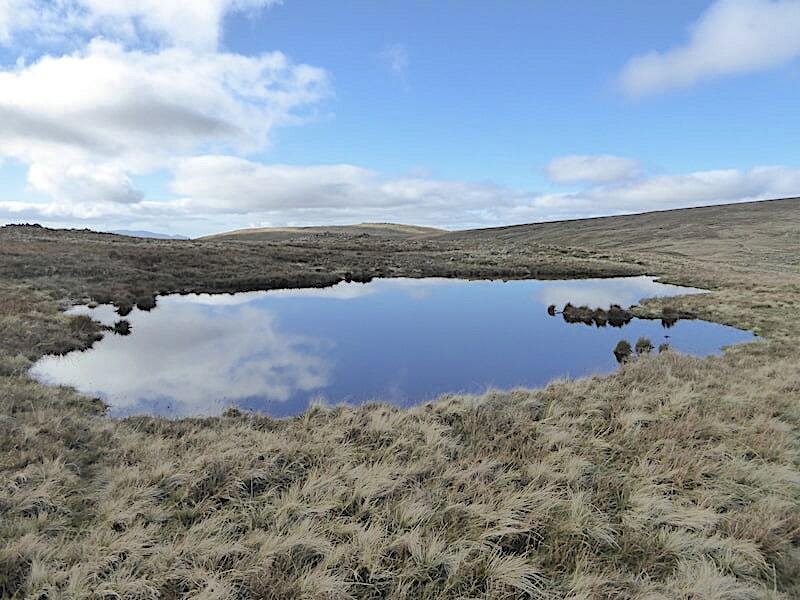 All is still at the tarn, apart from the few ripples created as the water flows quietly towards the outflow, where we lean on the wall and gaze up at the long plateau of High Street directly in front of us. Yes, out came the Mars Bar. 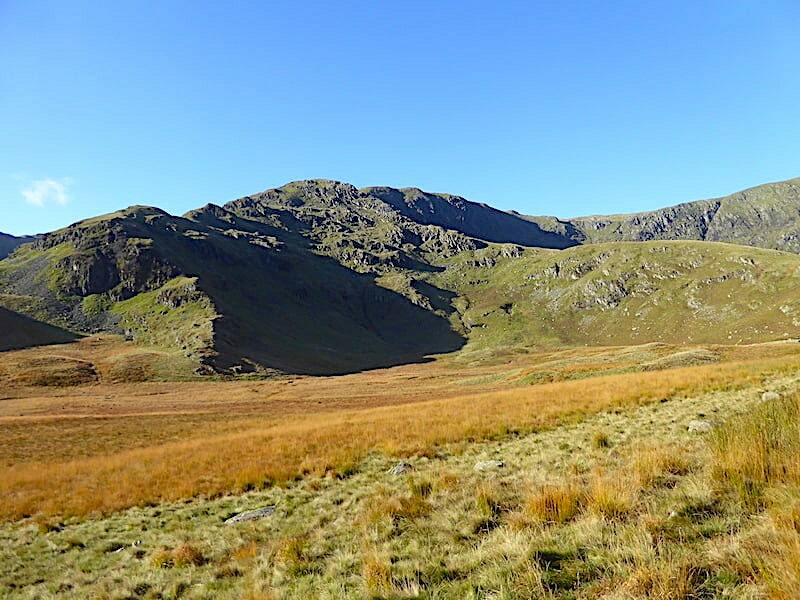 I take a look around during our R&R break, here’s the view up to Rough Crag on our left. I tried for some shots of the views to our right but they didn’t work out well owing to the very bright sunlight in that direction so I haven’t included them. I did manage this one looking back as we left the outflow and began the climb up to Caspel Gate although things are still a little washed out towards the top of the shot. 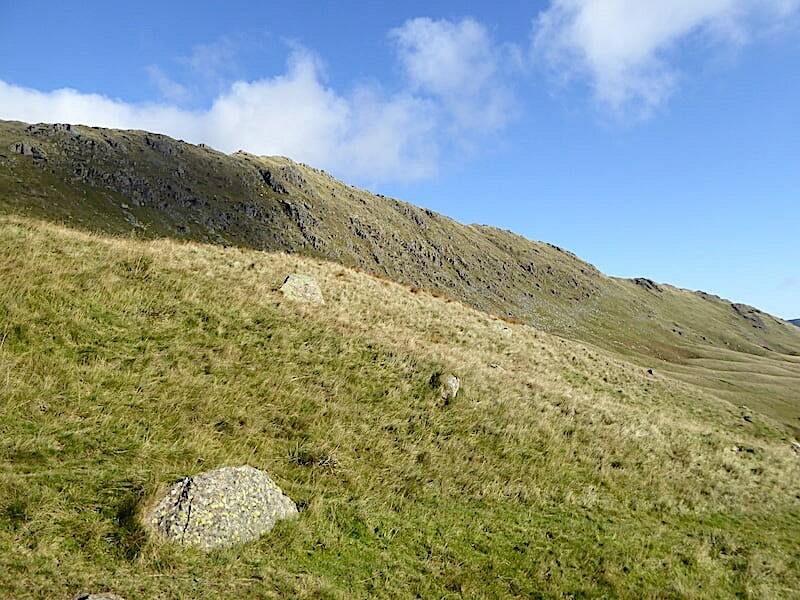 Harter Fell is just a shadowy lump but the sunny slopes of Branstree above the Gatescarth Pass showed up quite well. 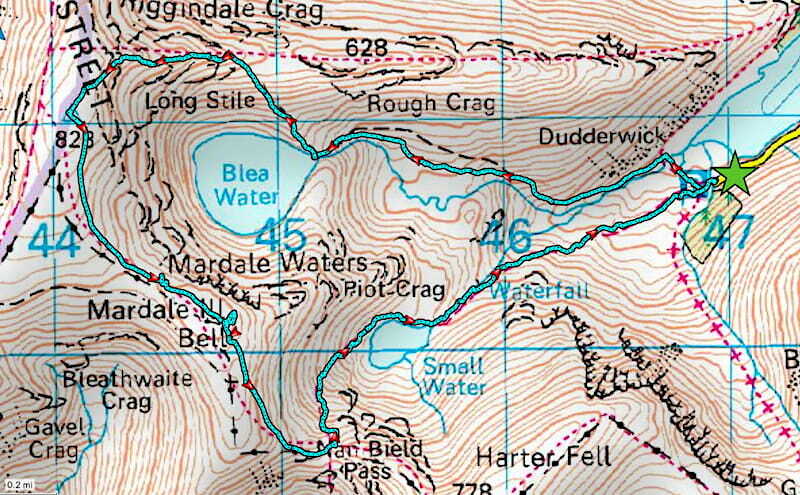 As you can see the path passes alongside the outflow so its very easy to spot. Looking ahead at the steepish climb up towards Caspel Gate. 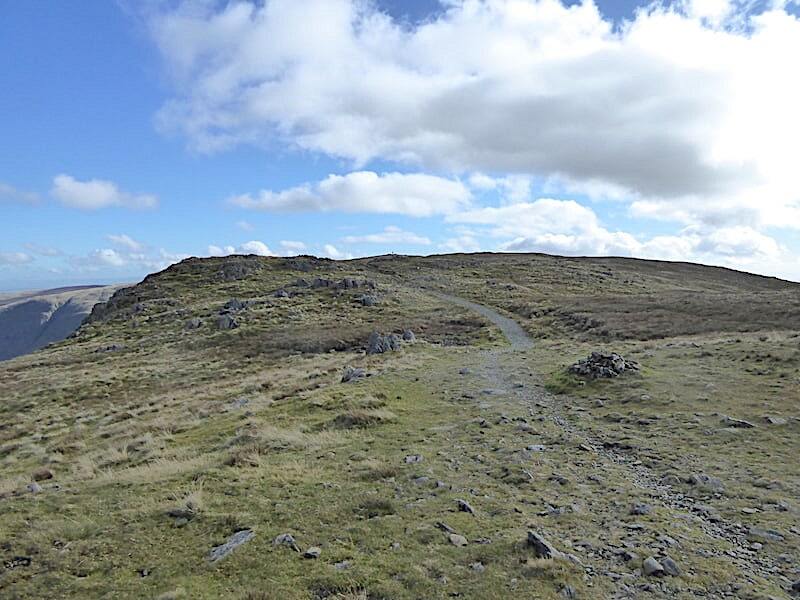 The path, just a bit soggy in places today, is grassy and well trodden which makes the going a lot easier, trudging up a steep hill over pathless, rough and tussocky grass is a real energy sapper. The brow mopping towel was on overtime up this section. Chopping out as much of the sunlight as possible I chanced a look back at Blea Water and Mardale Ill Bell’s rocky ridges beyond it. It didn’t turn out too badly despite the presence of various sun spots. 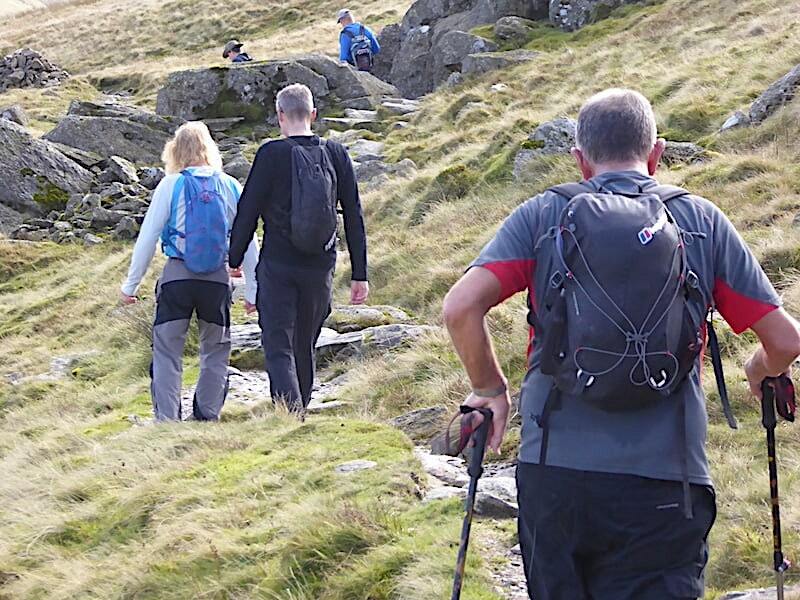 On we go, with the sun on our backs and our t-shirts getting damper and damper as we do. Even if there was any wind, which there wasn’t, we wouldn’t get any cooling benefit from it down here in this sun trapped bowl. 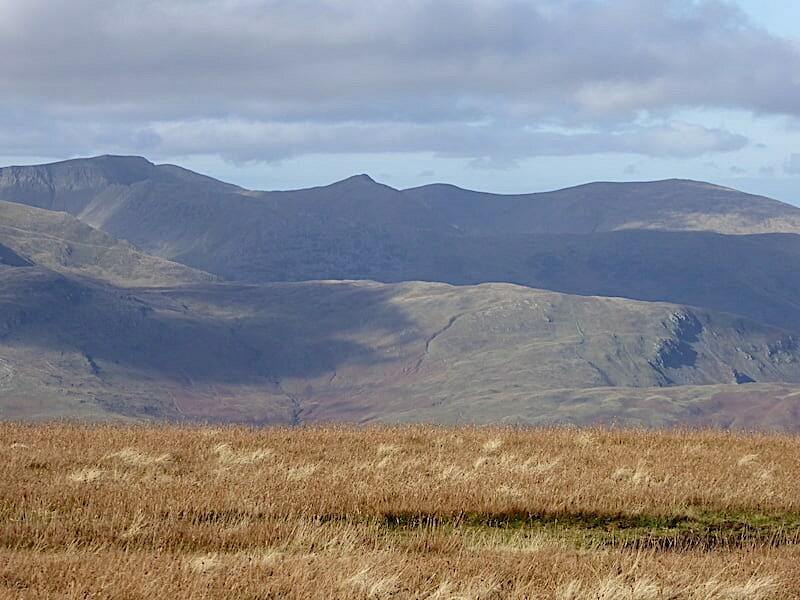 Selside Pike now joins Branstree on the left skyline. 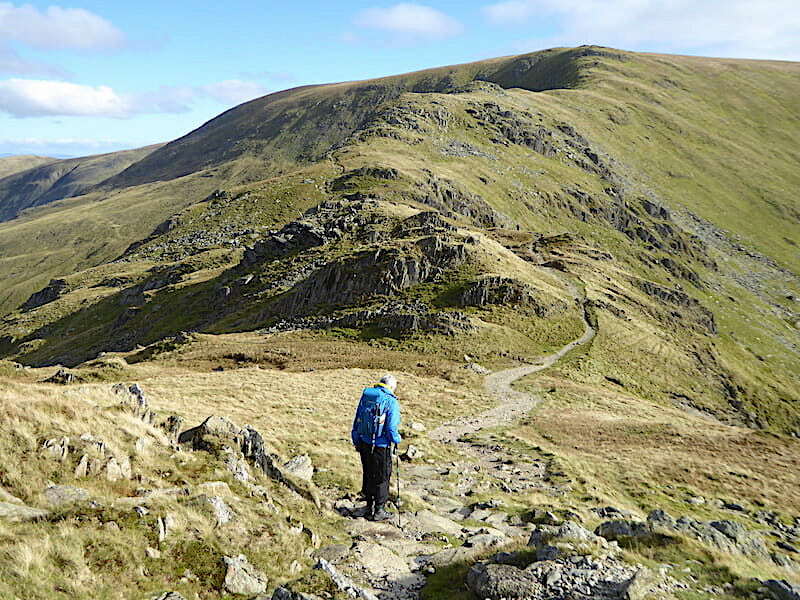 We see a couple of tiny figures crossing between Caspel Gate and Long Stile, an encouraging reminder, if one were needed, that it won’t be too much longer before we hit the ridge path and can take a bit of a breather before tackling the craggy ups and downs of Long Stile. 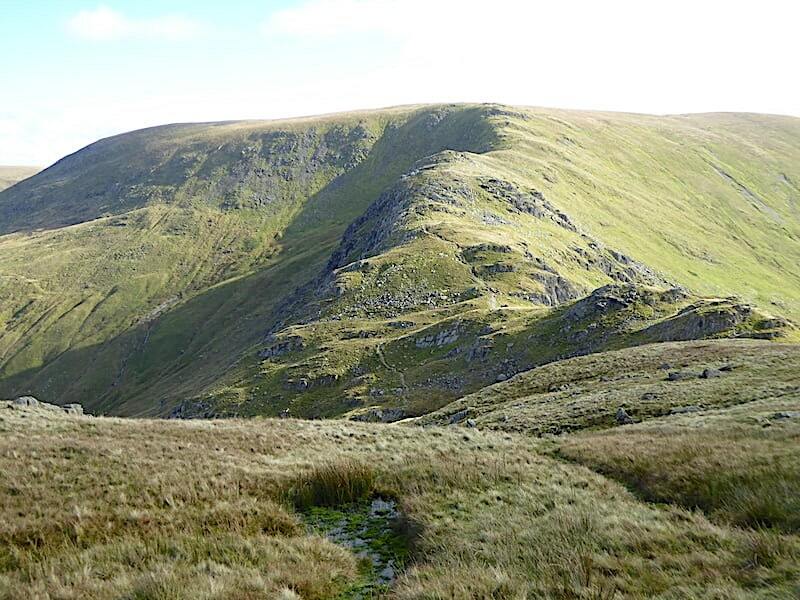 Ridge path reached with a brief hello to two walkers who walked over just as we set foot on it. They were heading for Long Stile too and were the first people we’d met so far, there is no-one coming along behind them. 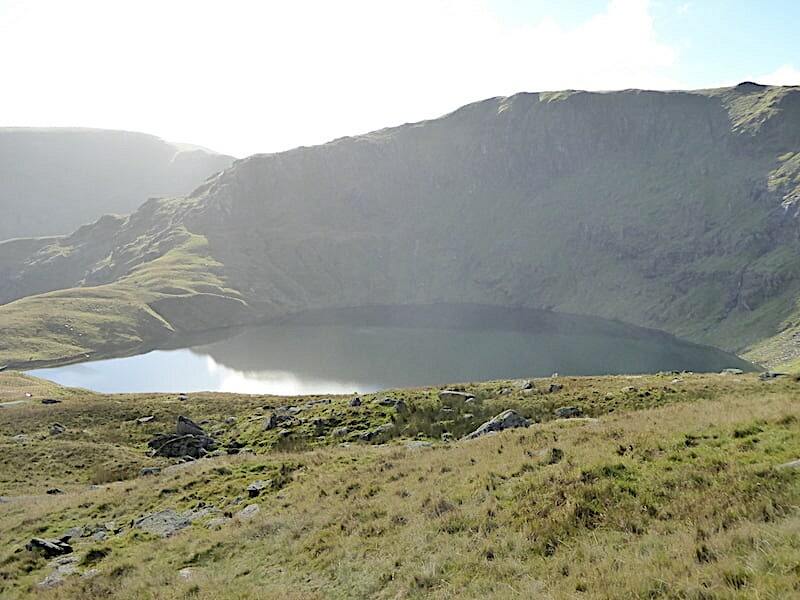 We take a breather while I take a shot looking back to Rough Crag with the Caspel Gate tarns just below them. 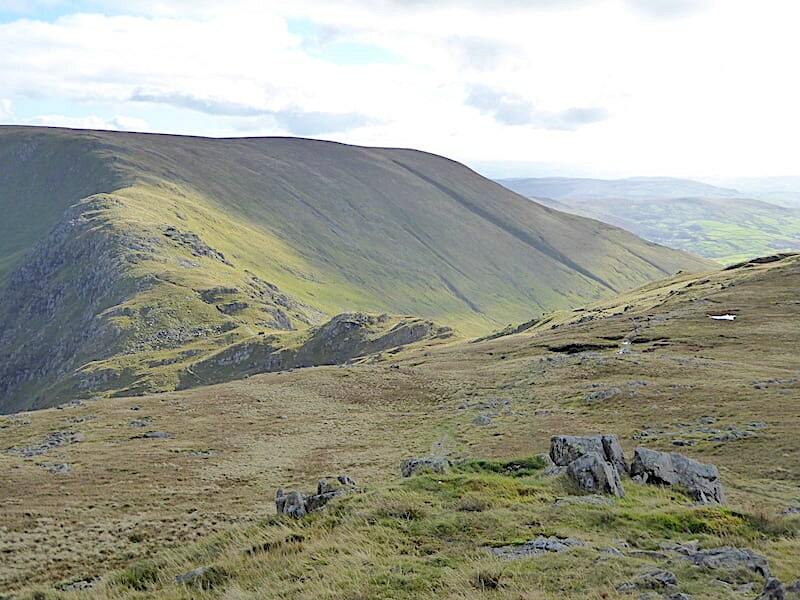 Another washed out shot as I take a look back to Blea Water before …..
….. we begin the climb up Long Stile, from where we have this view of Short Stile, Twopenny Crag and Kidsty Pike across Riggindale to keep us company. 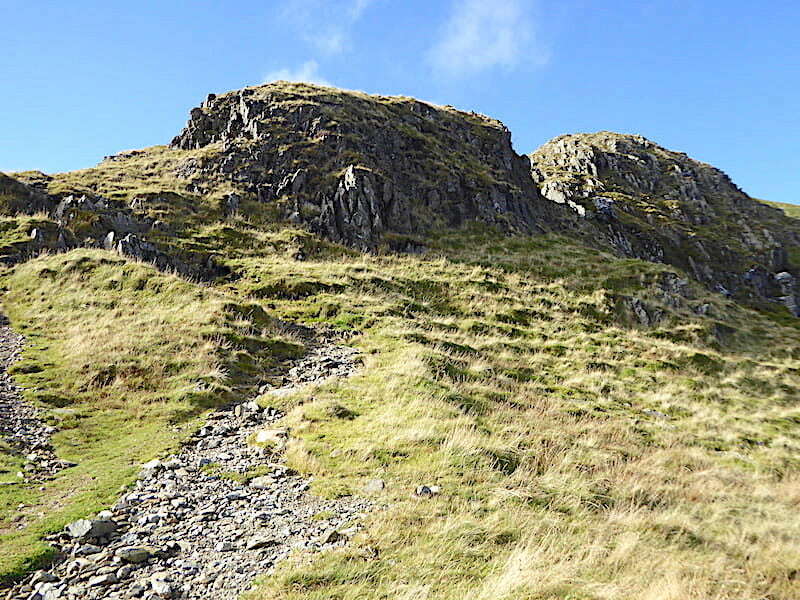 We had an enjoyable climb today, the rock was dry, the complete absence of any wind made even the craggier sections very much easier to deal with, and with the sun behind us there was no difficulty in seeing where we going either. 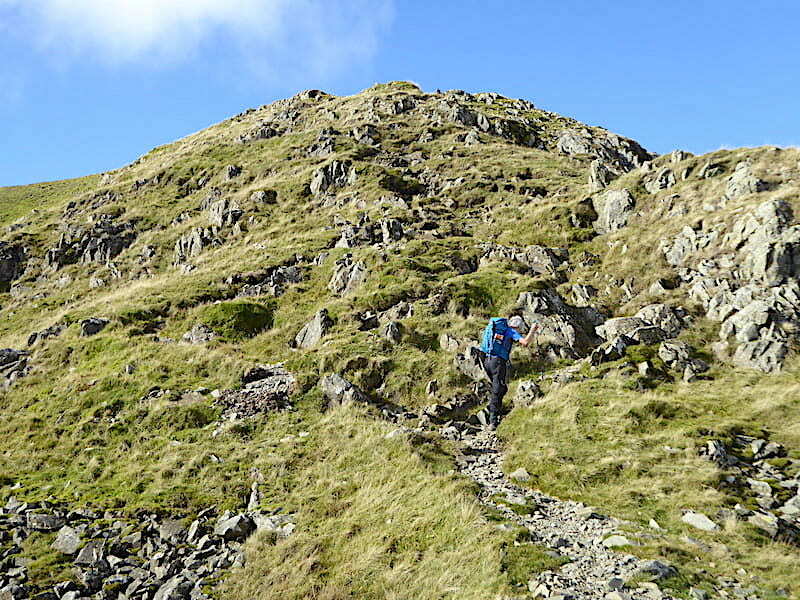 The two crags ahead do require some hands on work but the scrambling sections are not very difficult and don’t last very long either. It wouldn’t have been quite so much fun grappling with a strong wind though, especially as its a long way down on both sides. 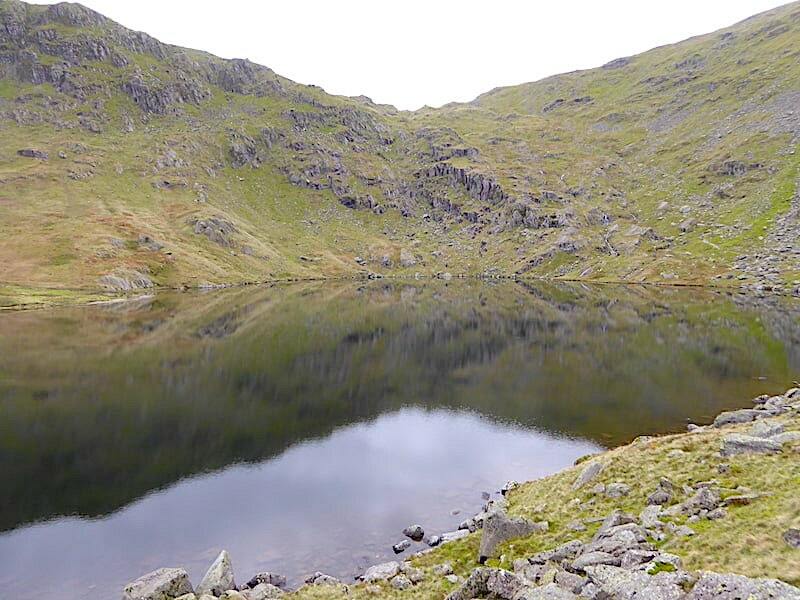 A rather better view back to Caspel Gate Tarn and Rough Crag as we climb higher and reach a suitable viewpoint. 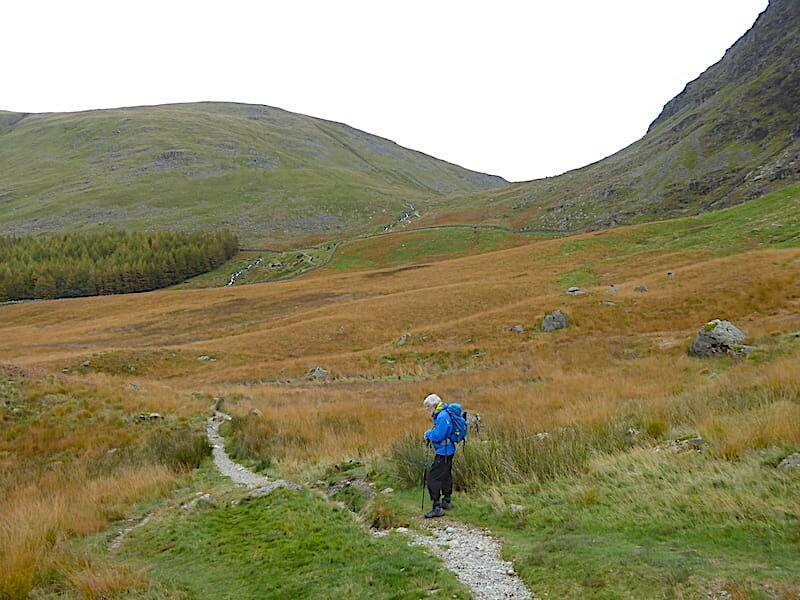 J considers the route ahead, its relatively straightforward but is punctuated with a few humps and bumps along the way. Generally speaking he’s not all that keen on high ridges so there must be something different about this one, perhaps the sense of exposure isn’t quite so strong across here. A look back at the view beyond some of the humps and bumps of the ridge. 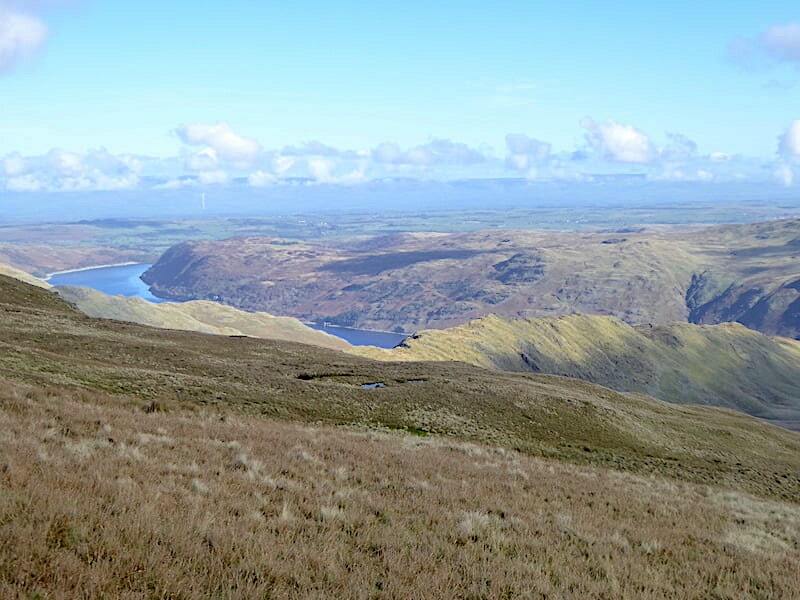 More of Haweswater has come into view, Riggindale has come out of the shadows, a line of cloud has appeared along the length of the northern Pennines on the distant skyline, and there are still no walkers making their way up behind us. 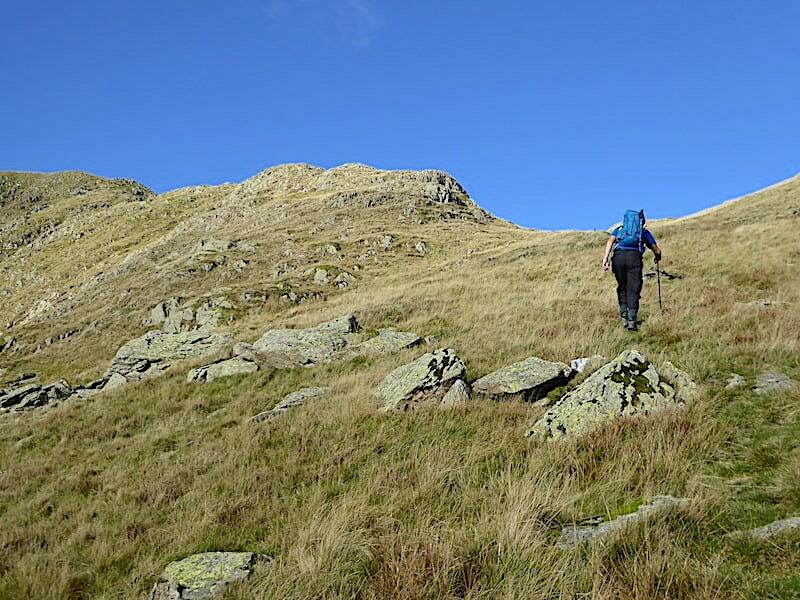 We aren’t done with the humps and bumps just yet though so on we go, steadily picking our way through the assorted rocks, boulders and outcrops as we follow the rising path, quite steeply in some places and much less so in others. 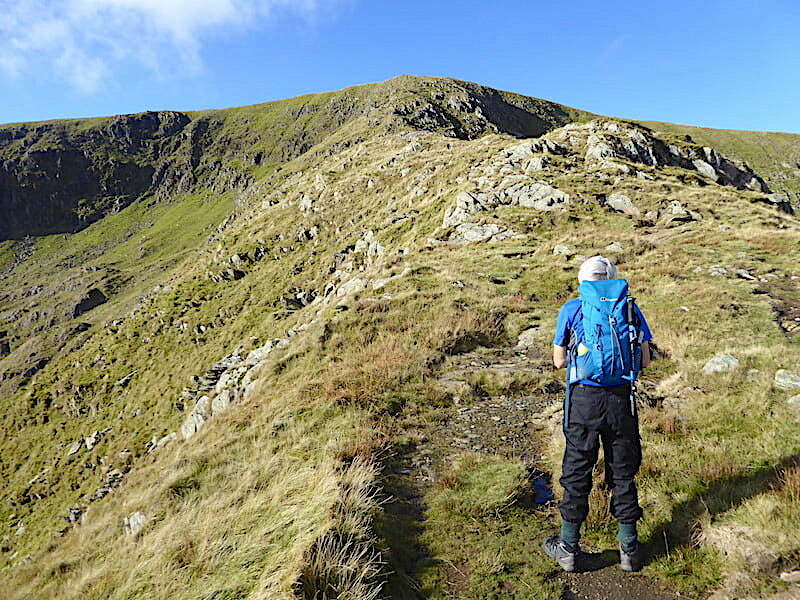 With so many twists and turns along the whole of the ridge, not just over this Long Stile section, this route is unlikely ever to appear in the ‘dull walks’ category. 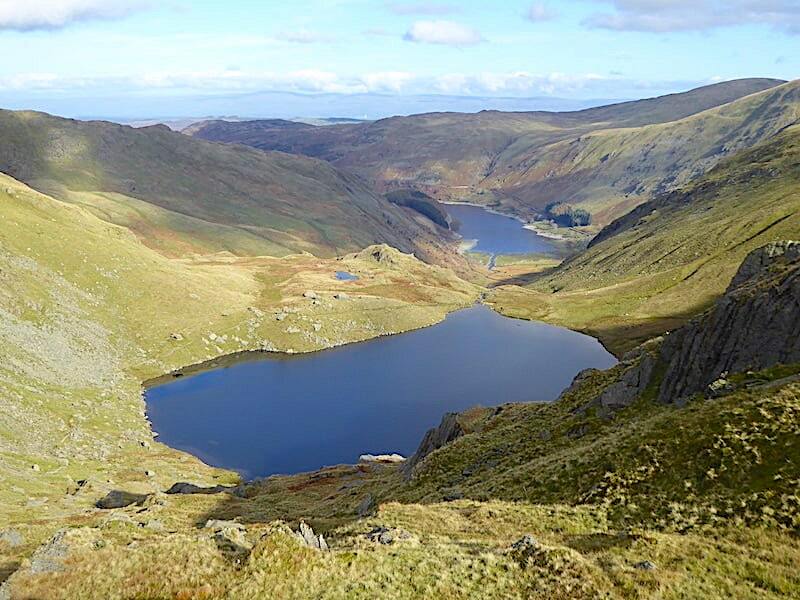 We reach one of the points along the way where its possible to stand with both feet flat on fairly level ground for a change, and pause for a minute or two to take in the lovely view of Blea Water with not a ripple on its mirror finish surface. 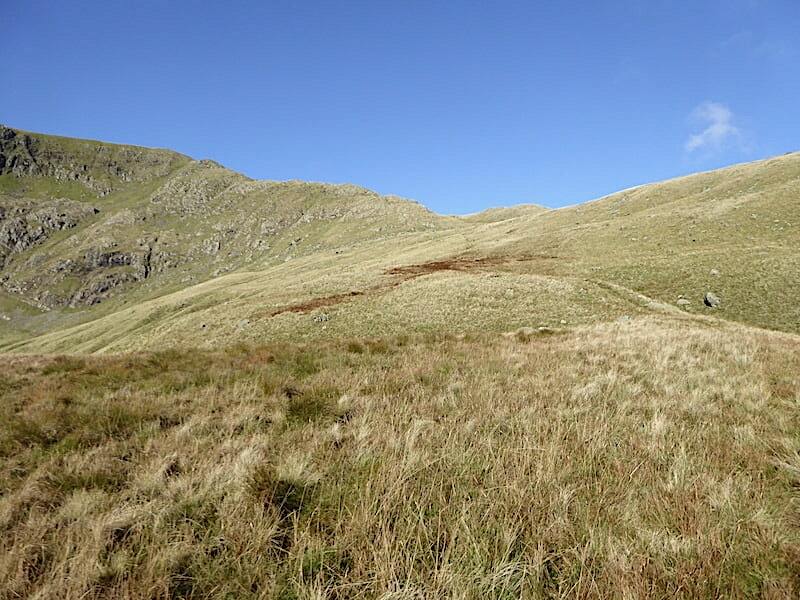 A little further up and over to our right I take another look along Riggindale again before we reach …..
….. the small grassy area below very last section of the climb. We last walked down here on a very windy day in October 2016 and this section of the path was horribly loose and badly eroded. 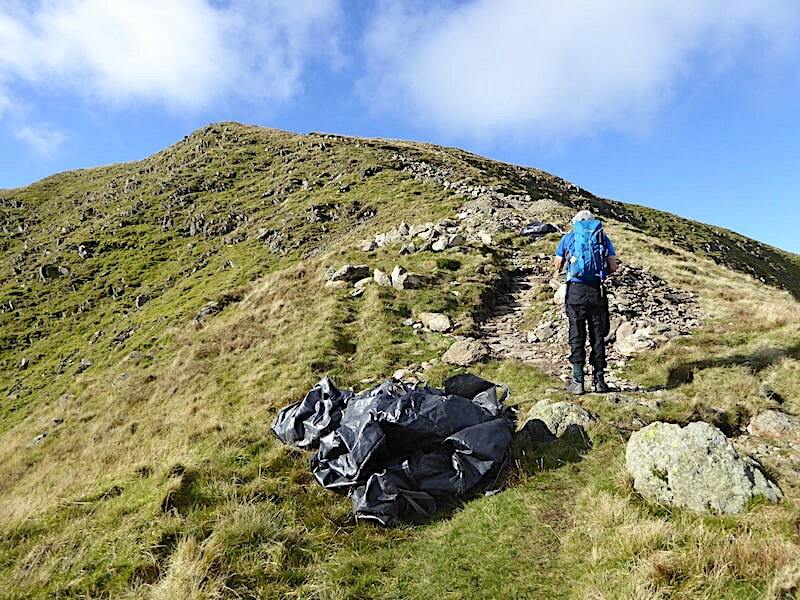 Since then Fix the Fells have replaced much of the erosion with stone pitching which made the walk up a whole lot less slithery than it used to be. It looks as though the work is still unfinished hence the bags of stone still lying around, and there is still quite a bit of earthing in and final landscaping to be done before the job is completed. At the cairn marking the end of the climb out of Long Stile I take a look across Kidsty Pike to High Raise just behind it in the shade. 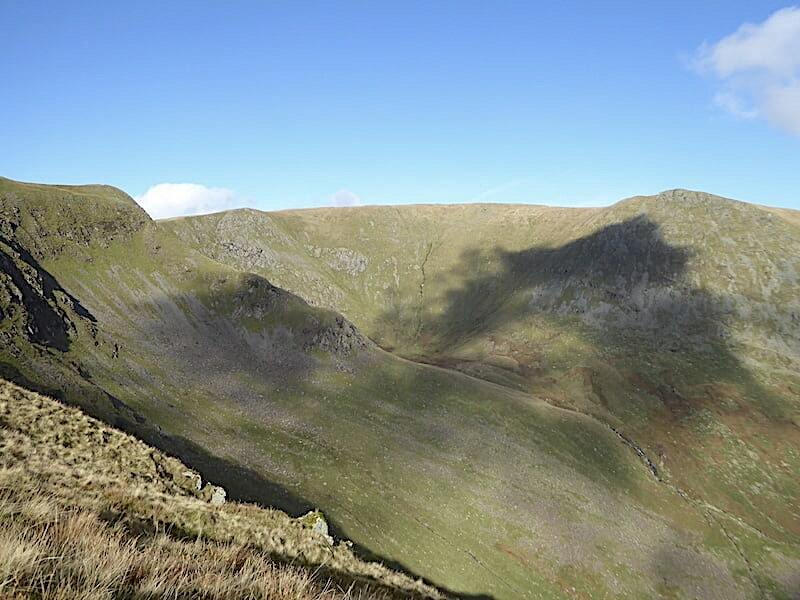 This High Raise being the Mardale one, not the Langdale one which we walked up to at the beginning of October. 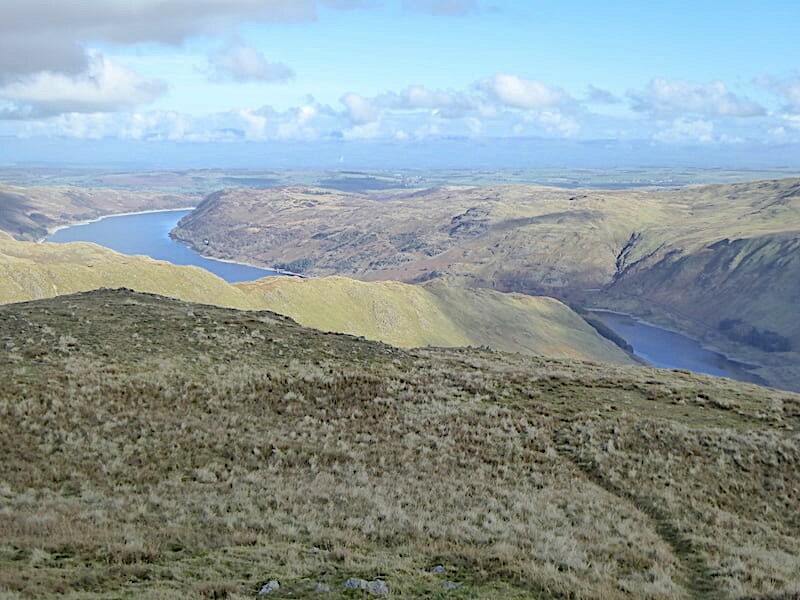 The fells of Swindale Common on the far side of Haweswater from the cairn. Rough Crag, below us to the right, is the only part of the ridge still in view now. 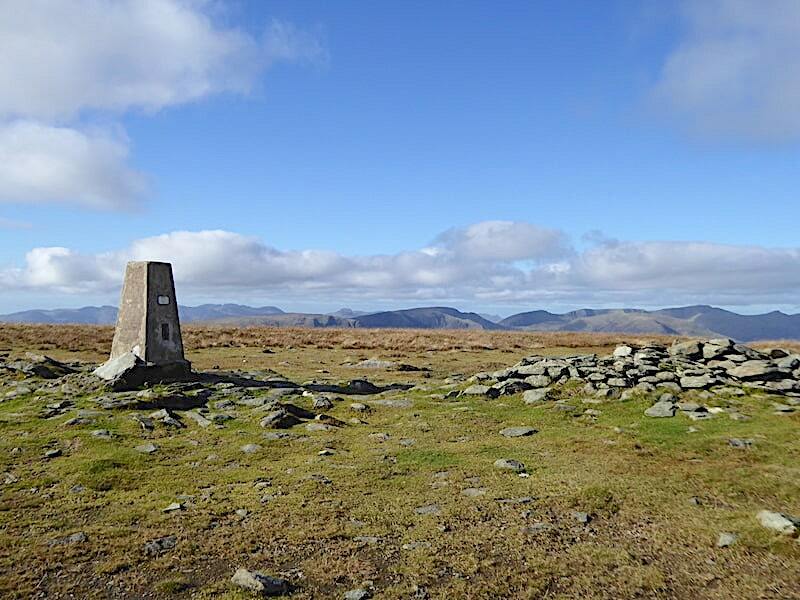 I took a few close up shots of the surrounding fells as we walked across to the trig column. 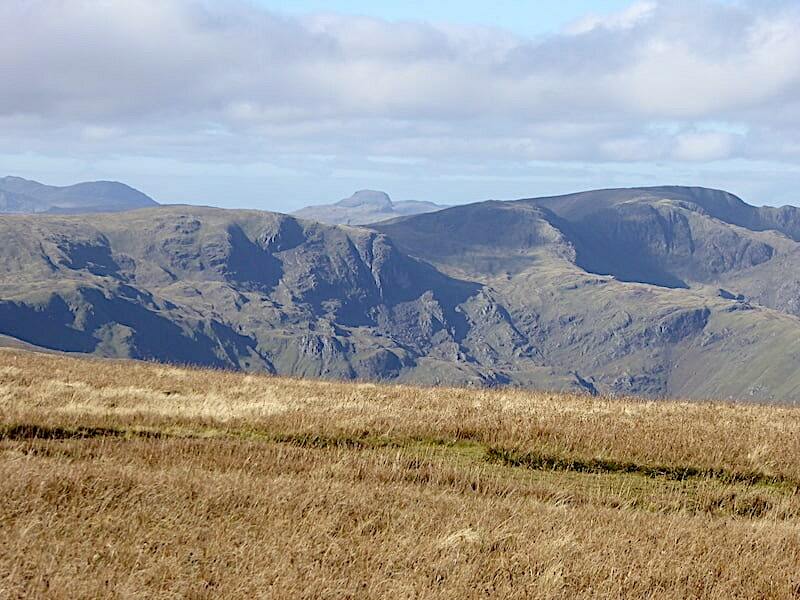 On the skyline, beyond the Dove Crag/Hart Crag/Fairfield range across the centre, are Scafell Pike, Great End and Great Gable. 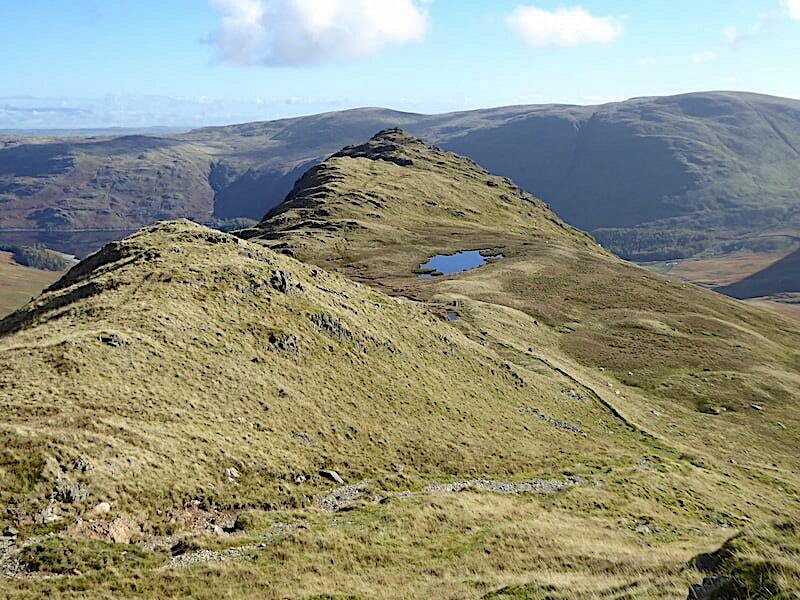 Saint Sunday Crag, across the centre, beyond which the tops of Dollywaggon Pike, Nethermost Pike and Helvellyn are just visible. 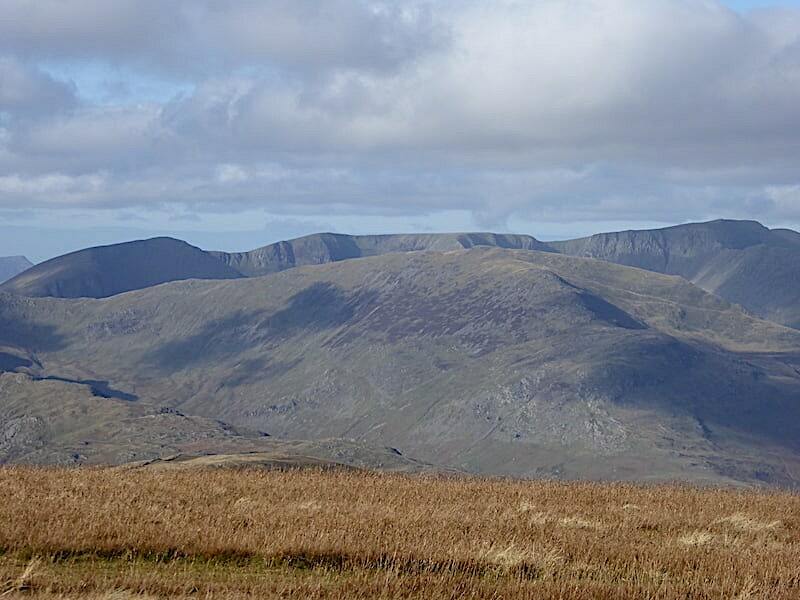 Helvellyn again, on the left, followed by Catstycam, White Side and Raise. 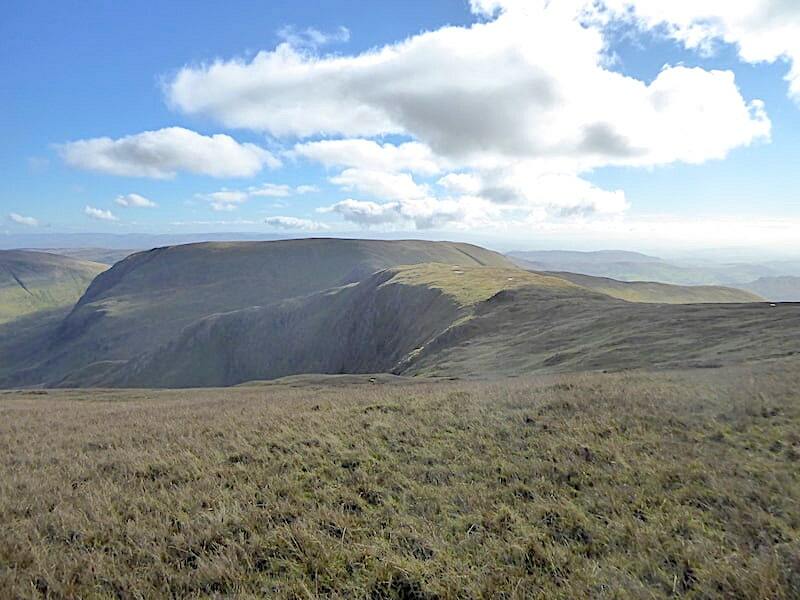 A little further round and beyond Green Side, the sunny fell in the centre, are the shadowy outlines of Stybarrow Dodd, Great Dodd and Skiddaw. 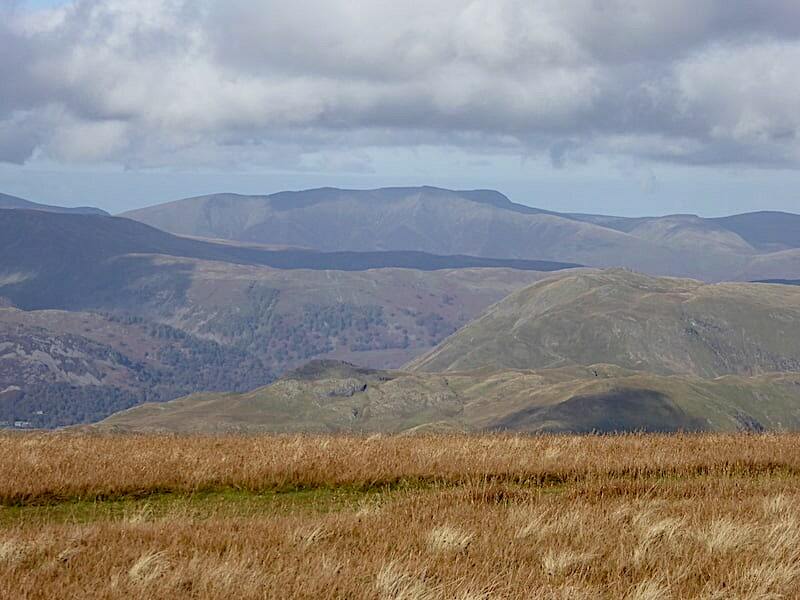 Further round still and now Blencathra dominates the skyline. 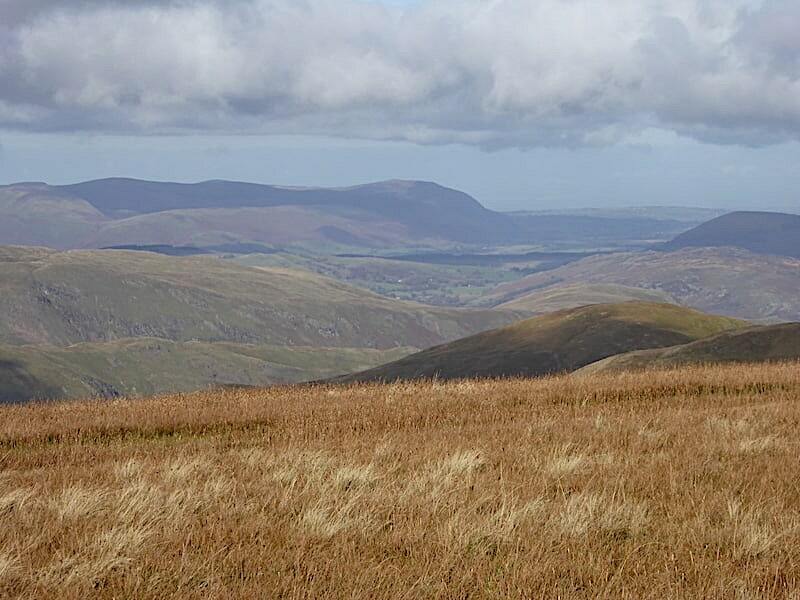 Continuing round from Blencathra and on the left skyline we can see Bowscale Fell, High Pike and Carrock Fell with a sunny Souther Fell just below all of them. 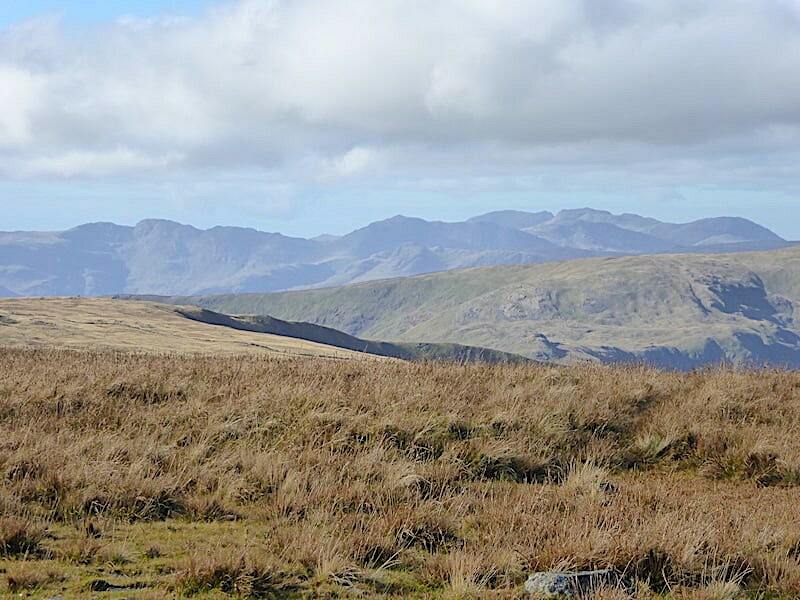 I waited until we reached the trig column for this shot of the very distant outlines of Crinkle Crags, Bowfell, Scafell, Scafell Pike and Great End. 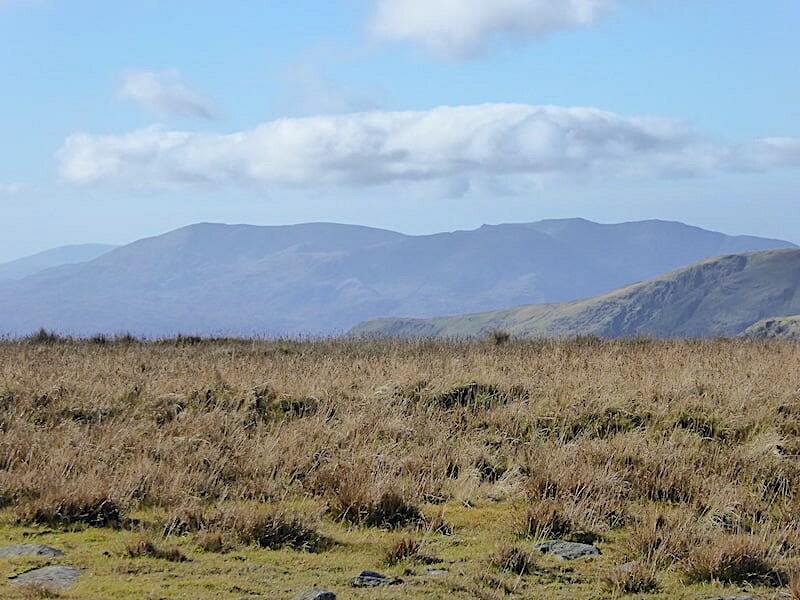 Finally the Coniston fells far away to the south west of us. 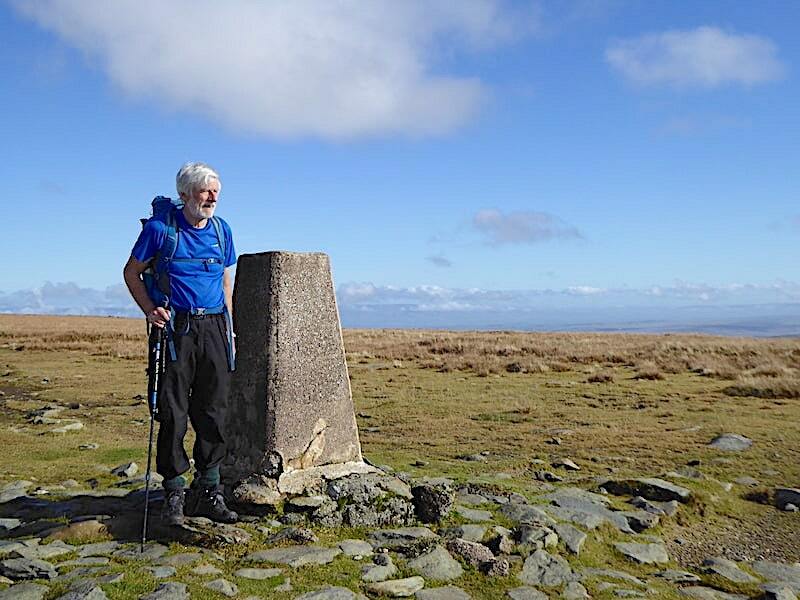 High Street trig column where J spots the impending arrival of a couple of mountain bikers pedalling swiftly across the vast plateau. Apart from them and us there was no-one else up here. They stopped just beyond the column, propped their bikes against the wall and sat down to eat their lunch. We decided to wait a little longer before eating ours. 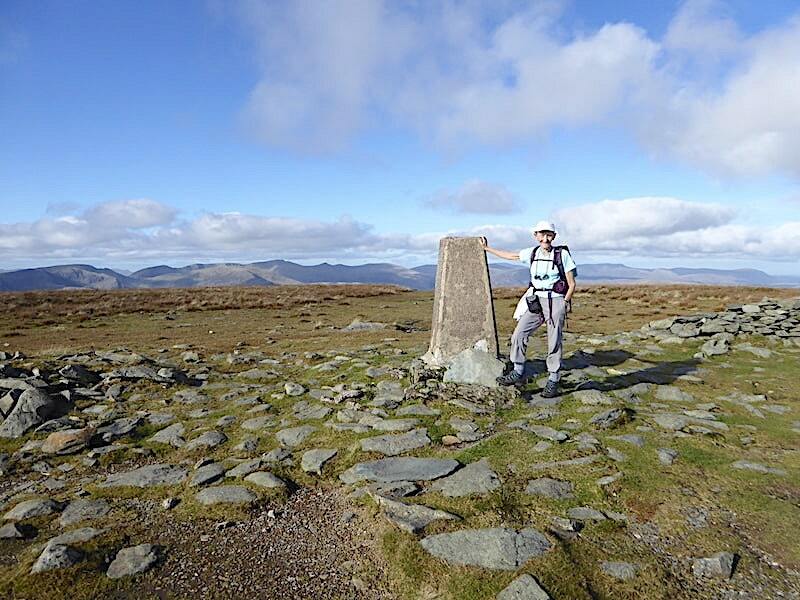 The extensive area of the summit plateau means that views of the surrounding fells are limited to their topmost areas …..
….. in whichever direction you care to look and you need to walk some distance away from the column before their lower slopes begin to appear. 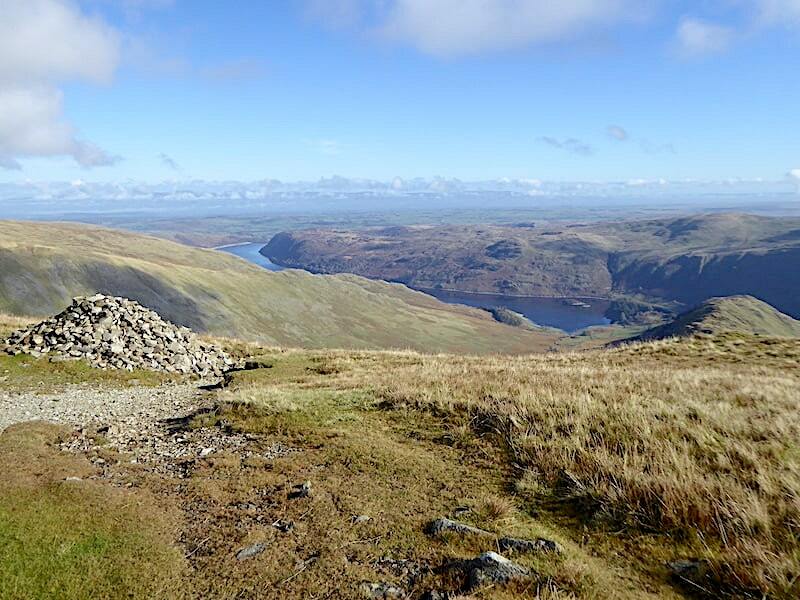 Having decided to wait until we reached Mardale Ill Bell before stopping for anything to eat we set off across the thin path which runs across the grass a little way below the engineered route. At this point we lost the light as the cloud arrived and stayed above us for the next hour or so. Still sunny over to the east but not over here and the temperature drops as the cloud cover increases, we stick it out in t-shirts for the time being. 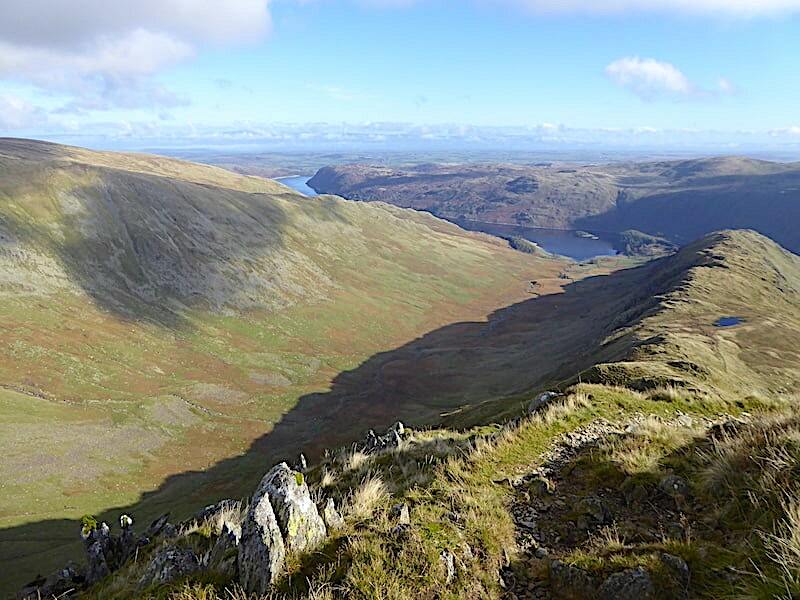 Sunshine on the Long Stile/Rough Crag ridge and the fells around Swindale with Haweswater reflecting the lovely blue of the sky above it. 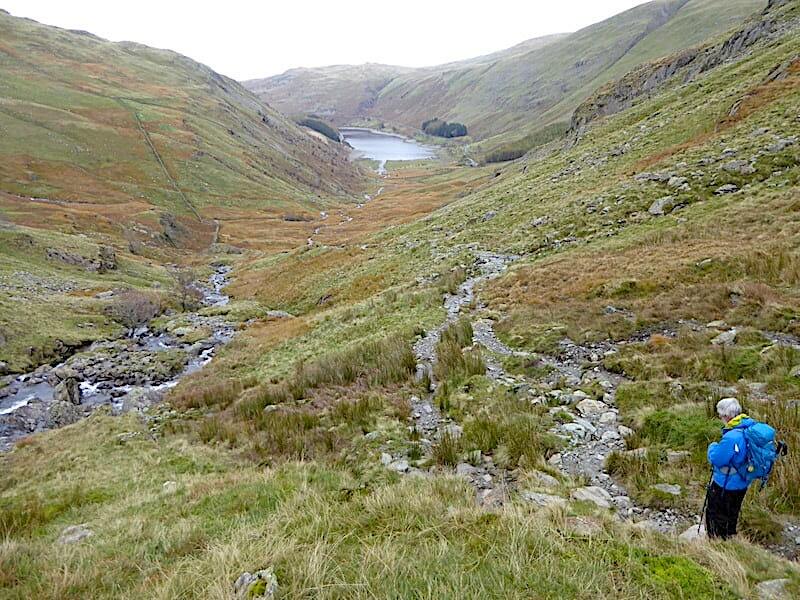 No sunny warmth over here though as we join the track over to Mardale Ill Bell. We are both feeling the chill now so we stop and put on our lightweight windproofs. Its not to keep the wind out, since there isn’t any, but simply to keep some heat in as we walk the short distance over to the summit cairn. A few more people were around across here walking in both directions although it couldn’t be described as busy. 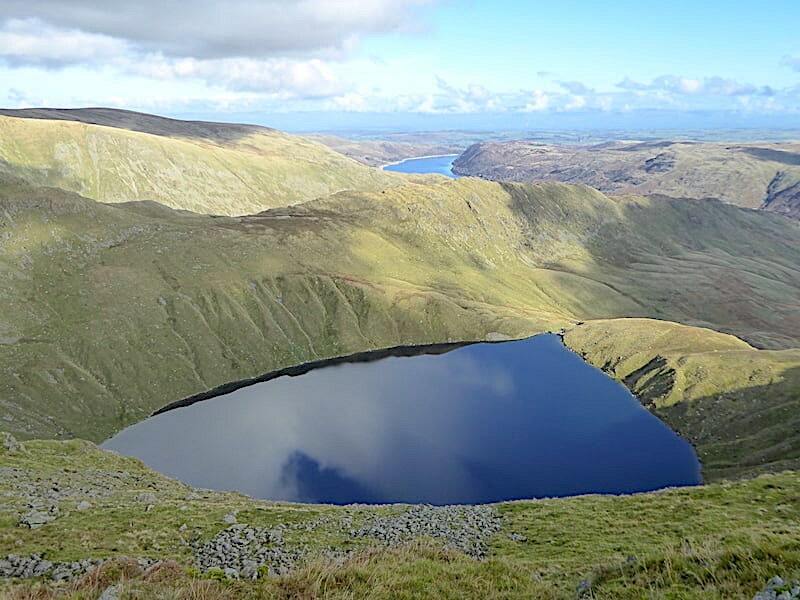 A short diversion from the path provides this wonderful view down to Blea Water with part of Haweswater beyond, and if you care to zoom in you may be able to pick out our route from the outflow up to the depression just beyond Caspel Gate Tarn between Rough Crag and Long Stile. 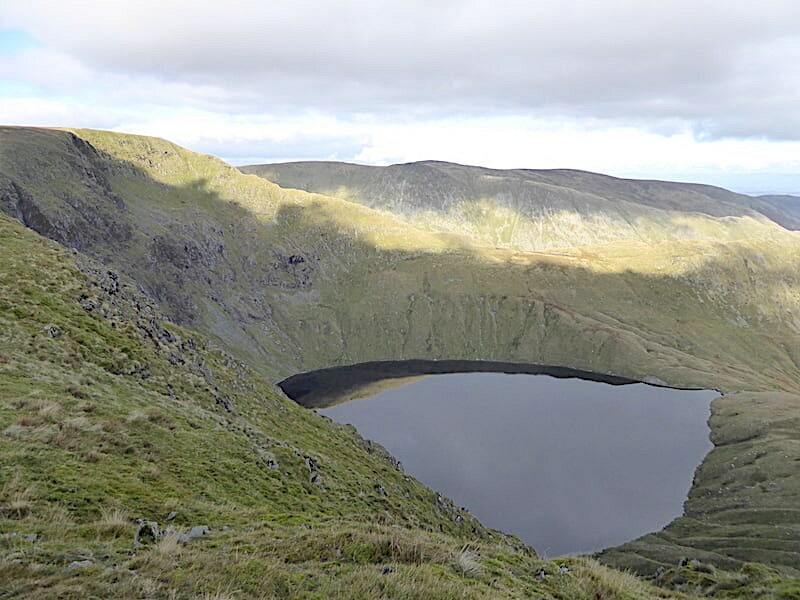 The cloud continues to build and hang over us as I take a look directly across to the Long Stile ridge …..
….. and a rather bleak looking view across one of the tarns towards Thornthwaite Crag. We could see the Beacon quite clearly from here but its not showing up too well in the shot. 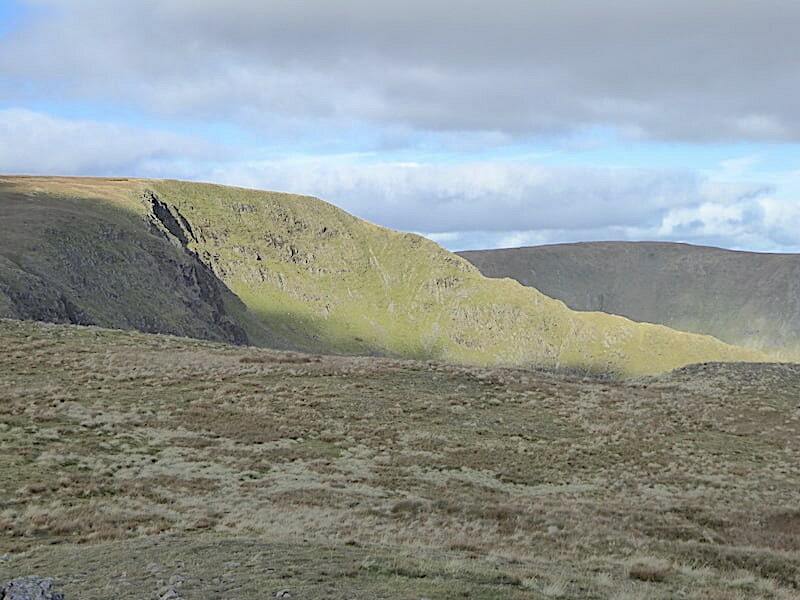 The lack of any hint of a breeze kept the large cloud bank practically stationary above us all the way across to Mardale Ill Bell with the ridge and the fells to the east remaining in bright sunlight. 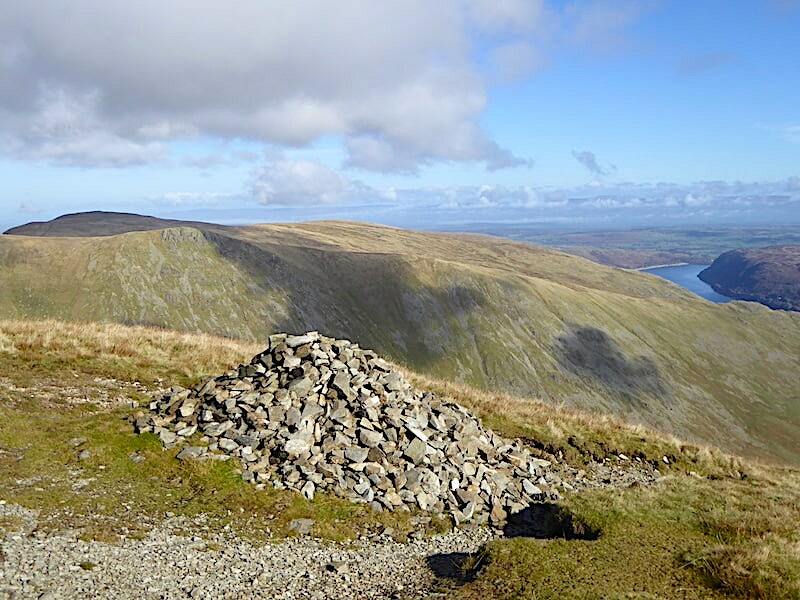 Sunny Long Stile in sharp focus as we approach the cairn on Mardale Ill Bell with …..
….. me also in sharp focus standing on top of it. We’re both now quite chilled and as soon as I clambered down off came the lightweight windproofs and the pair of us donned our fleeces and insulated jackets before finding somewhere suitable to sit and have our lunch break. The brow mopping towel, still tucked into the waist belt of my pack, has been superfluous to requirements since leaving High Street but I’d forgotten all about it. It was packed away again during our lunch break and didn’t see the light of day during the remainder of our walk. My gloves have been on for some time. 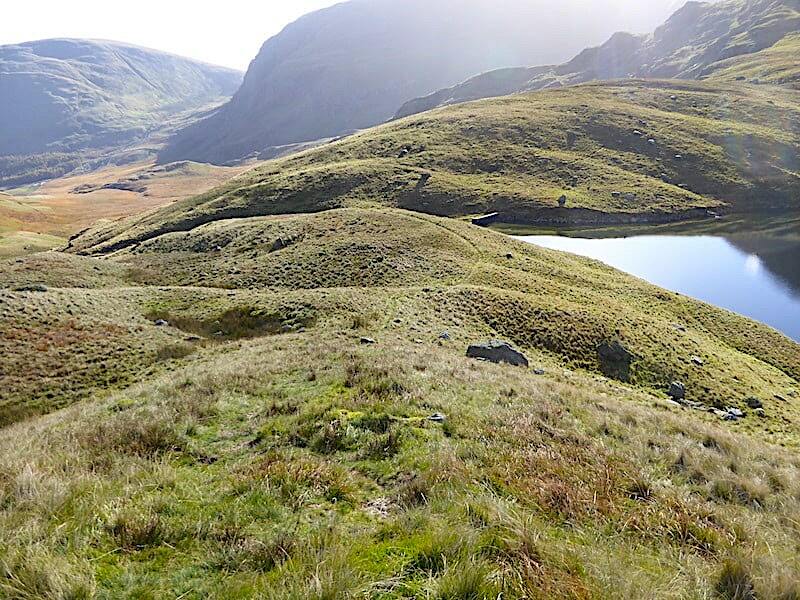 Another shot of Blea Tarn after lunch, no blue sky reflections in it now …..
….. but Riggindale still looks colourful in its autumnal hues. Yoke, Ill Bell and Froswick across the Kentmere Valley as we begin to make our way down to Nan Bield Pass after our lunch break. 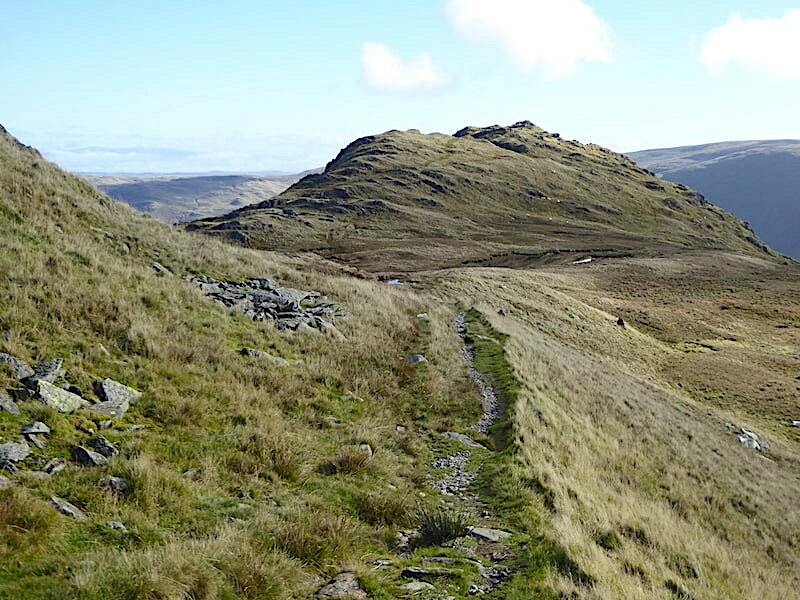 Harter Fell and its sunny north western ridge ahead as we make our way down …..
….. and to our left, in ascending order are Selside Pike, Branstree and Harter Fell. 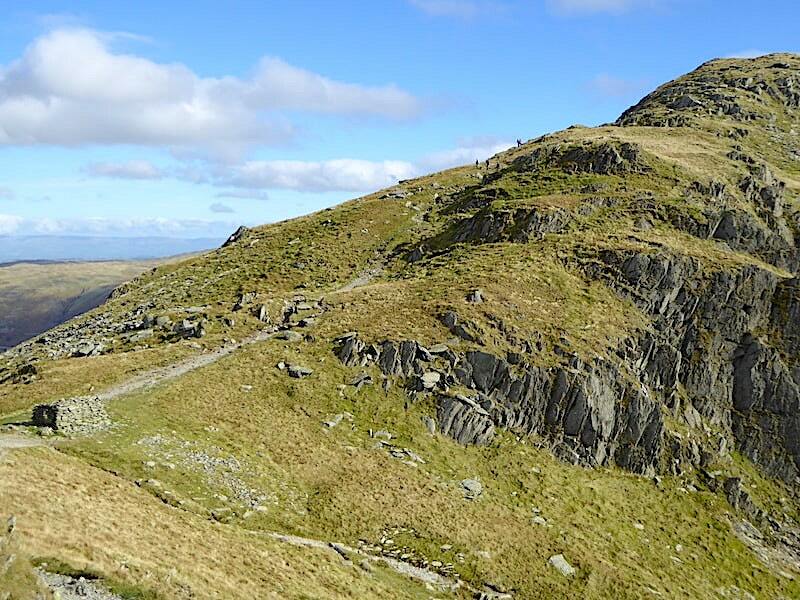 The path to Harter Fell summit rising over the ridge from the Nan Bield Pass. I had just taken the previous shot when I heard a very distinctive and quite recognisable voice behind me. As I turned round I saw the long fair hair and knew immediately who it was. Whether he was taking a group on a guided walk or just out with a group of mates I don’t know, perhaps some of you will know who he is. 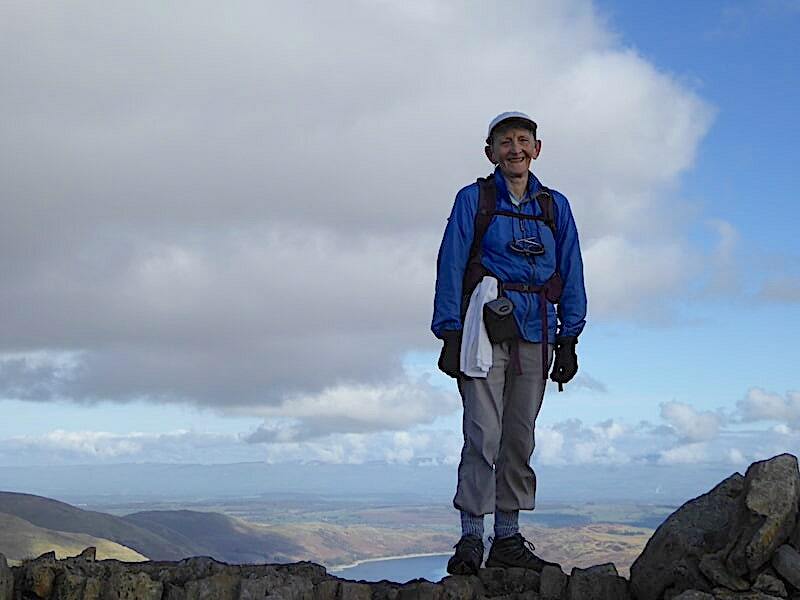 If you need a clue he’s on TV from time to time and appeared in Terry Abraham’s film ‘Life of a Mountain, Blencathra’. 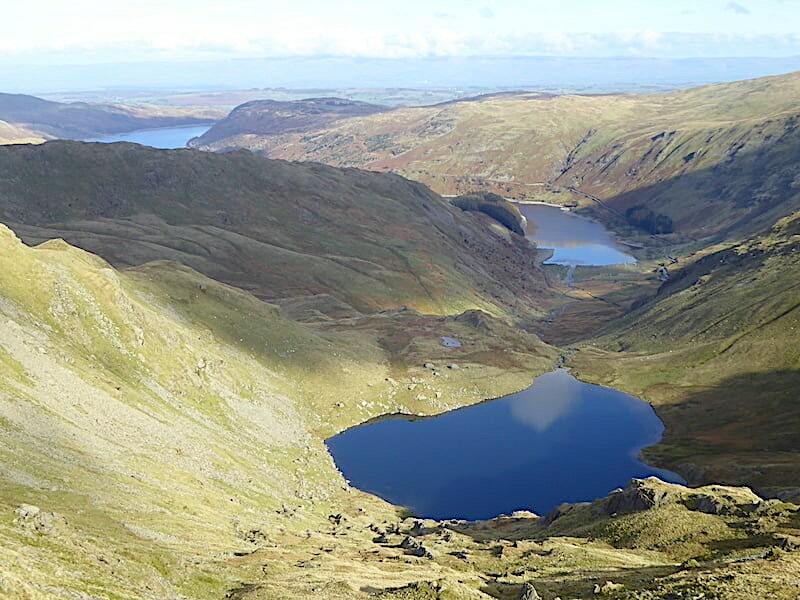 The sapphire blues of Small Water and Haweswater caught my attention as we descended and …..
….. of course I just had to take a close up. Dropping down to the top of the Nan Bield Pass where the walking group who came by us a couple of photos back have disappeared behind the hill just below us. 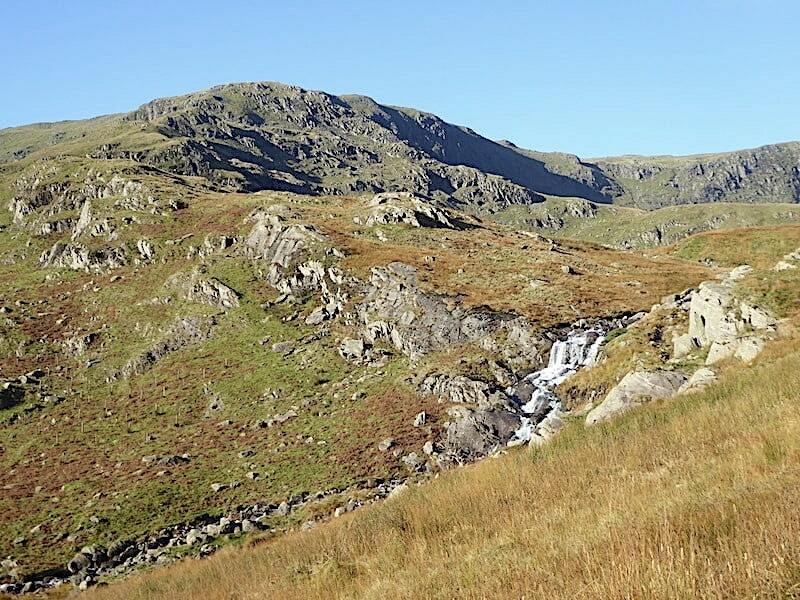 The Nan Bield shelter comes into view as the walking group continue on up Harter Fell. The slow moving bank of cloud has finally shifted and we have a sunny spell once again. The warmth is back and I’m now overheating so at the shelter we stop so I can remove my jacket. Feeling a lot less like a steamed pudding and a whole lot more comfortable now I’m minus my jacket we begin to make our way down the pass. 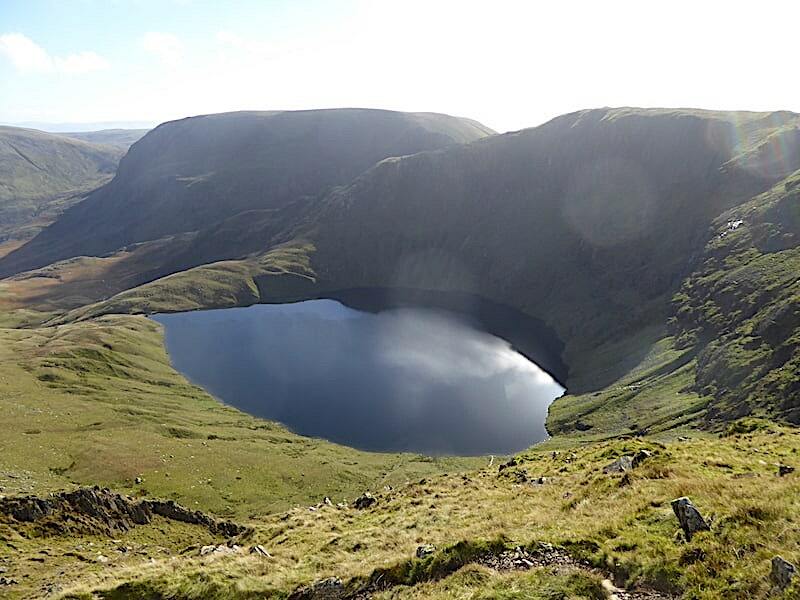 J, still wrapped in jumper and jacket and unwilling to lose his body heat again, waits while I take yet another shot of Small Water and Haweswater during the descent. 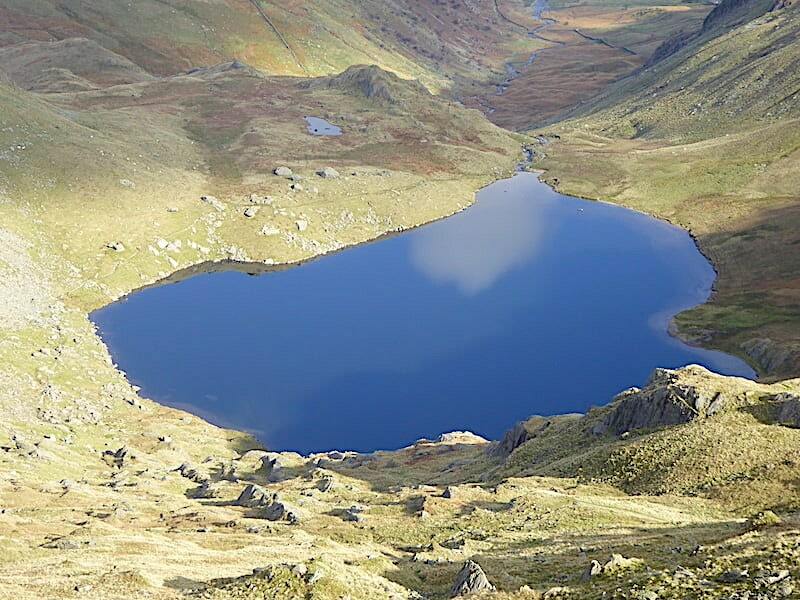 One of these days we’ll get around to walking up to the little tarn nestling in the low hill to the left of Small Water, it might make for a decent little outing come the short winter days when the cloud is really down. We’re about halfway down the pass now so I took a look back. The cloud cover is total now but as we’ve lost quite a bit of height the drop in temperature isn’t quite so noticeable and my jacket stays off. 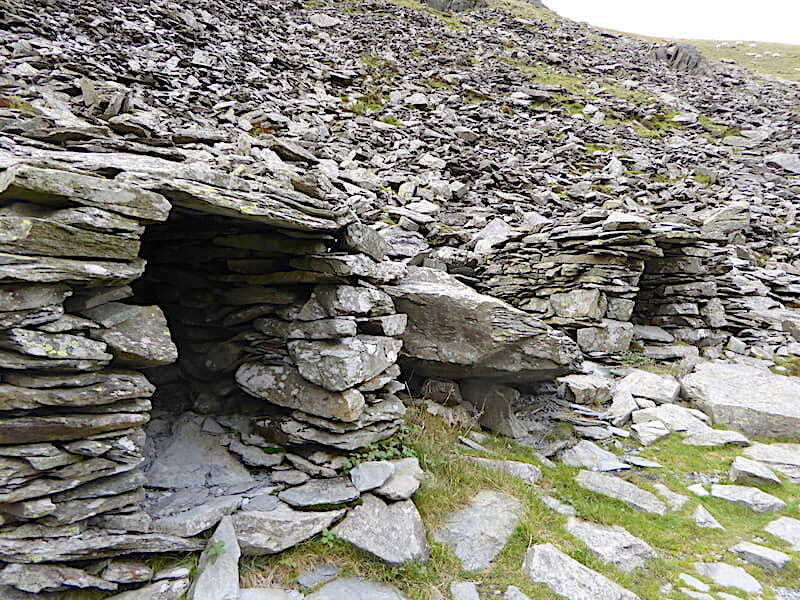 Down alongside Small Water now where the stone shelters sit right beside the path. Room for one only in each of them and I always get to wondering how many travellers using the pass in days gone by have been glad of their protection during extreme weather. 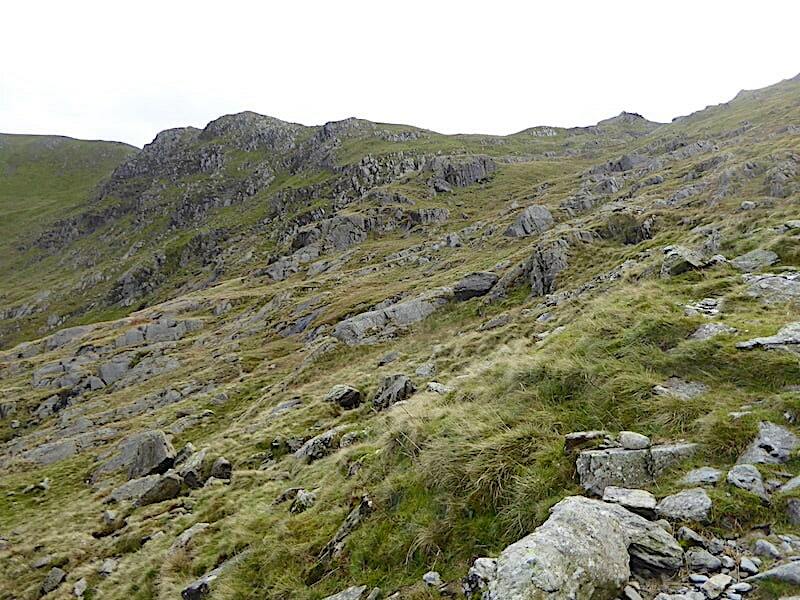 The view looking back up to the top of the pass as we round the tarn, still not a breath of wind but a very dull sky now. 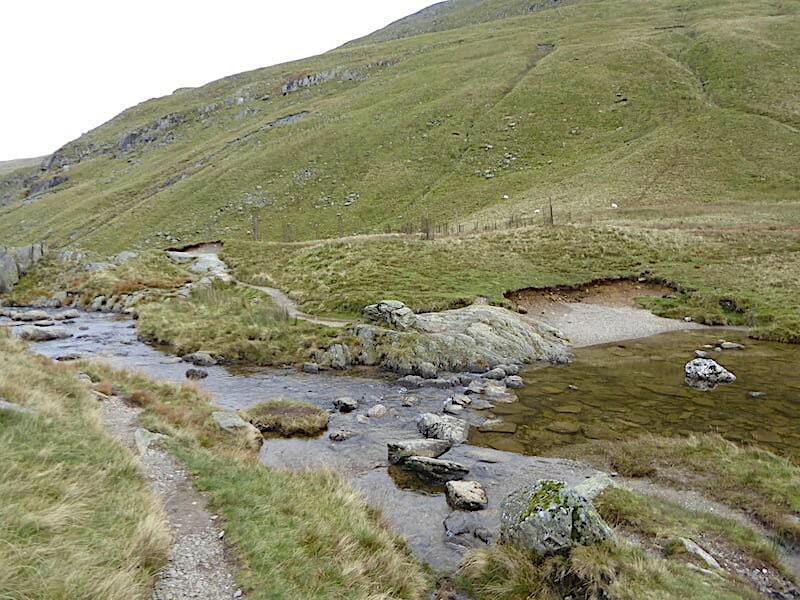 No problems crossing the stepping stones at Small Water’s outflow after which …..
….. we descend the path beside Smallwater Beck, the water cascading loudly over its numerous falls …..
….. as it makes its way down to Haweswater. 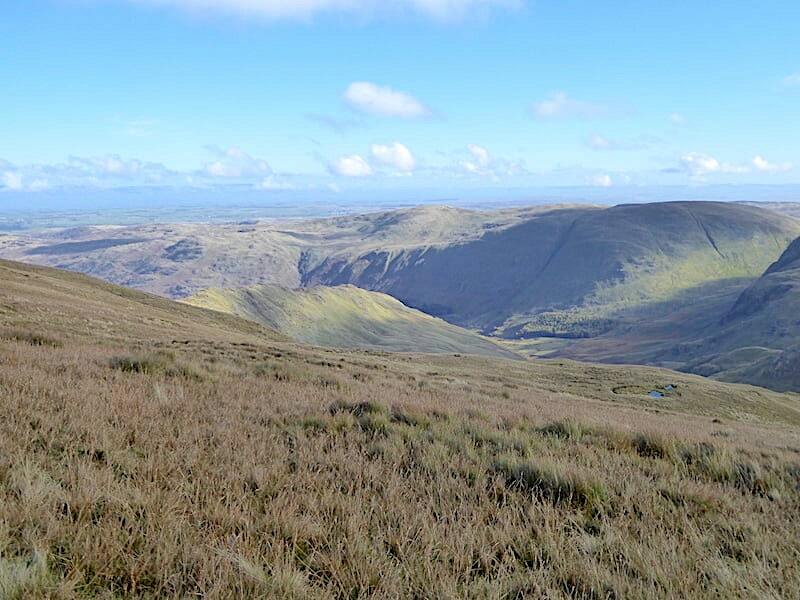 A look over to the Gatescarth Pass between the slopes of Branstree and Harter Fell as the gradient decreases and we approach the valley bottom. 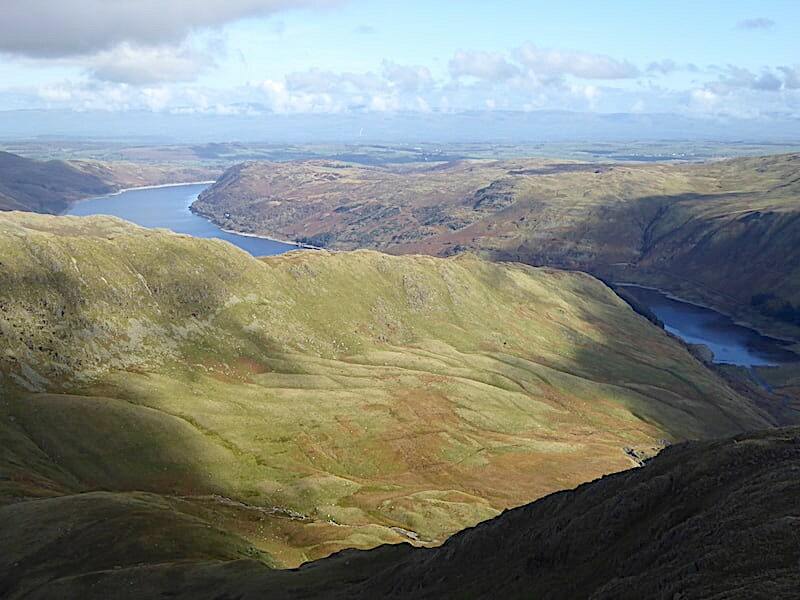 Mardale Banks on the skyline ahead of us as we drop down to Haweswater and the car park. 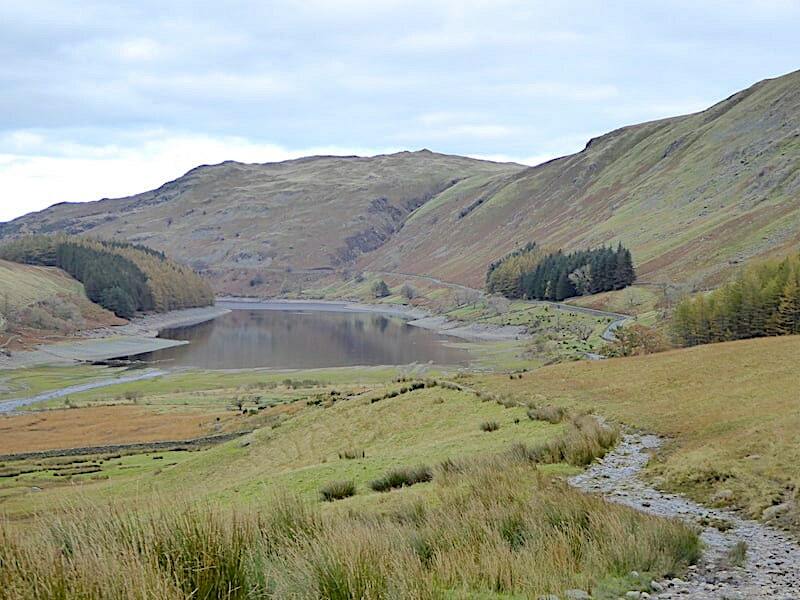 The water level is still well below where it should be but the remains of the old village of Mardale Green have just about been covered over once again. If you look closely at the head of the water towards the right hand side you might just be able to pick out the two walls of one of the old lanes, and over on the left hand side the top of another wall is still visible but that’s about all there is to see now. Come the springtime I expect all will be back to normal. 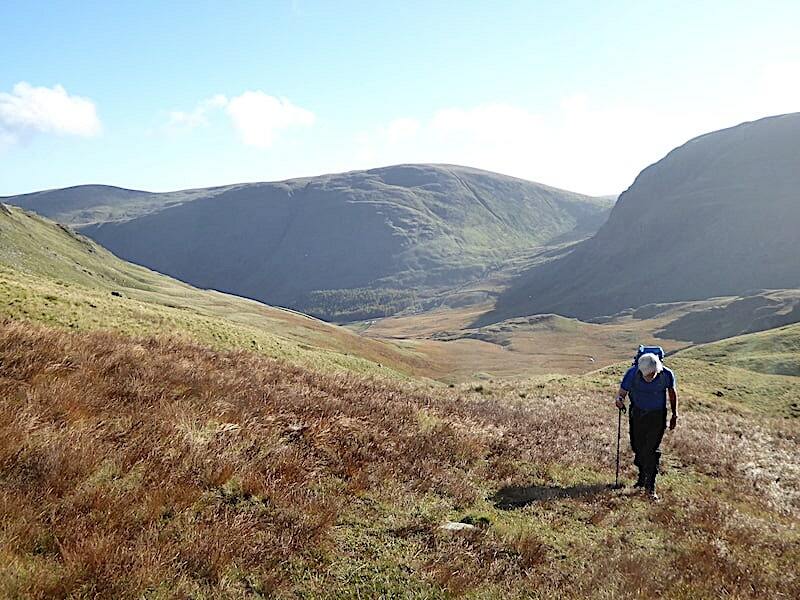 Thoughts of springtime are a reminder that if the dry weather holds we’ll have to spend some of the coming weekend putting the garden to bed for the winter, so getting out on the fells again will be put on hold until next week. There’s always a job to be done isn’t there?